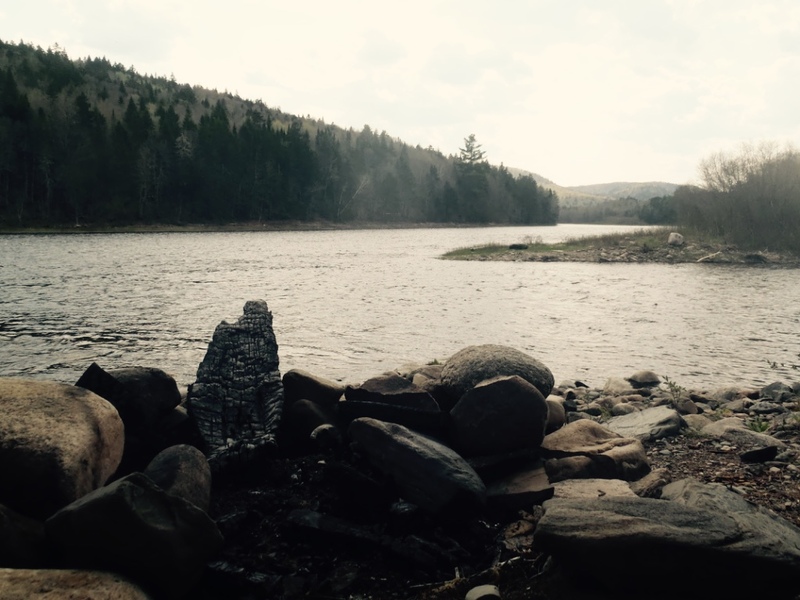 In New Brunswick, at Springtime, all eyes turn toward the rivers. They watch as nature forces snow and ice downstream to make way for change. Winter resists like a toddler at bedtime, it throws debris and jams itself into corners, making life miserable for those nearby. 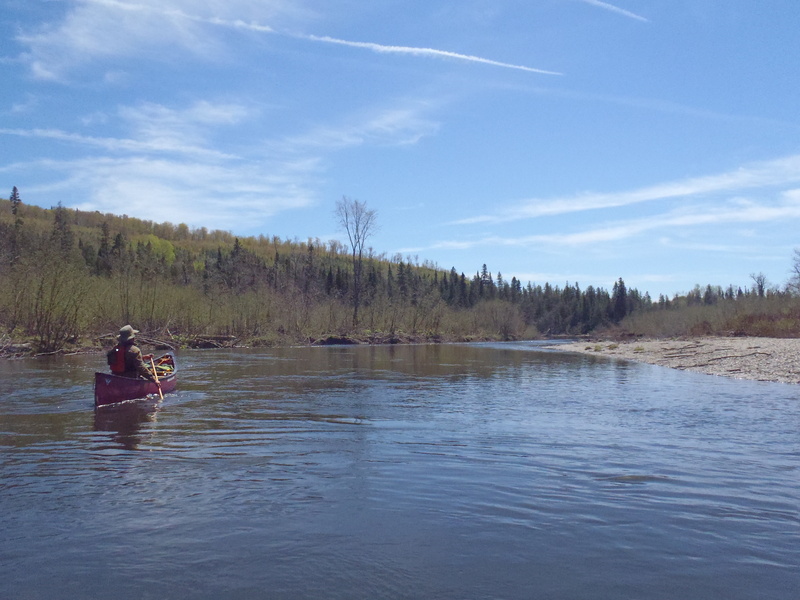 The spring freshet is essential for canoeists, it makes the impassable passable. But, it can also present extreme danger. Strong currents carry fallen trees that get held in the river. These trees create dangerous obstacles. 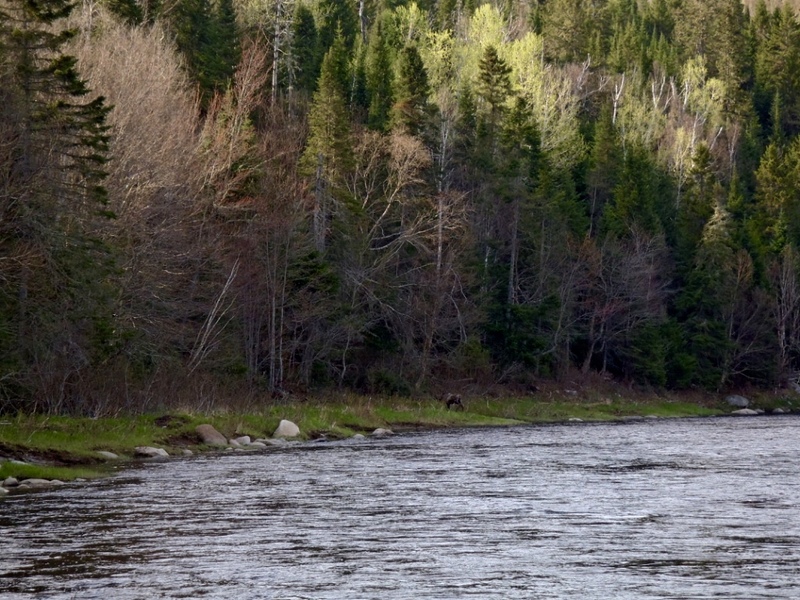 The Little Tobique River is a narrow, meandering river in northwestern New Brunswick with a reputation for collecting logs. 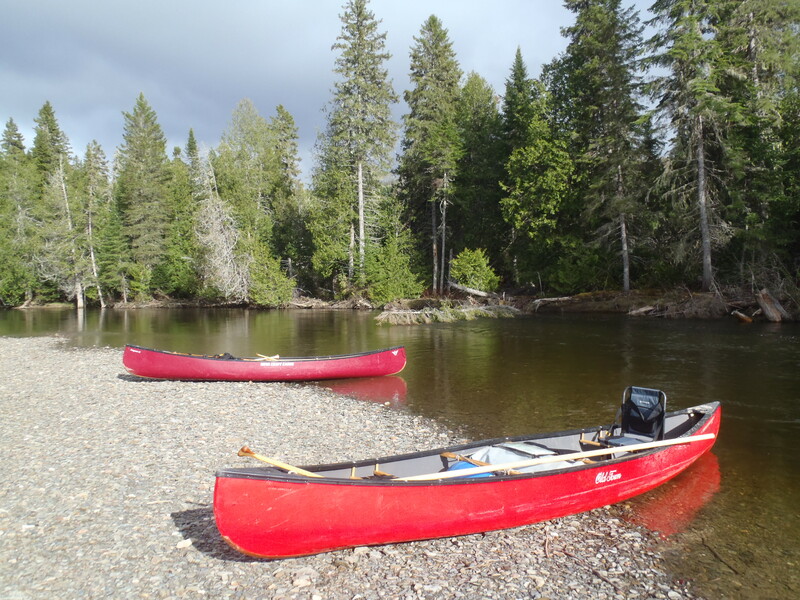 Paddling stories from the river describe careening toward shore after encountering impenetrable log jams. The river emerges from Nictau Lake near Mt. Carlton. For 60 km or so, it snakes its way through the tail end of the Appalachian Mountains before it merges with the Tobique River near Nictau, N.B. 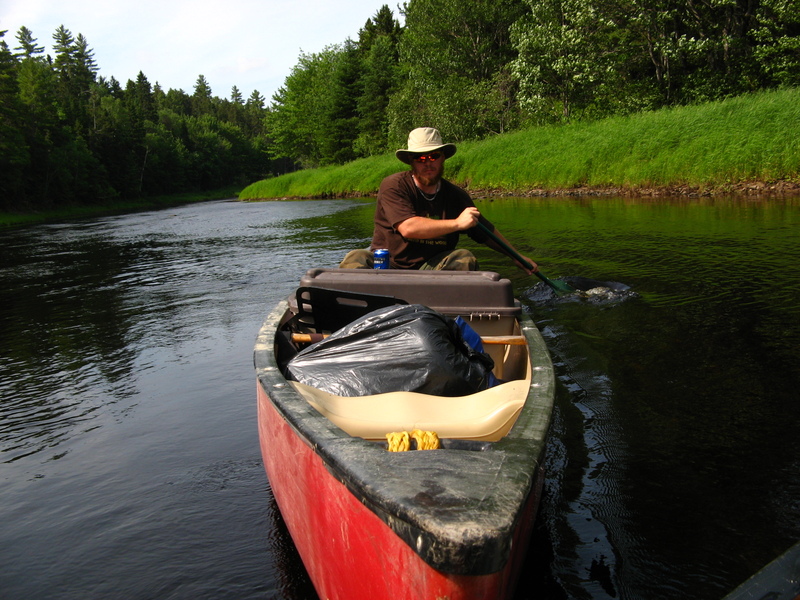 In the past, the current of the Little Tobique carried logs to downstream sawmills. 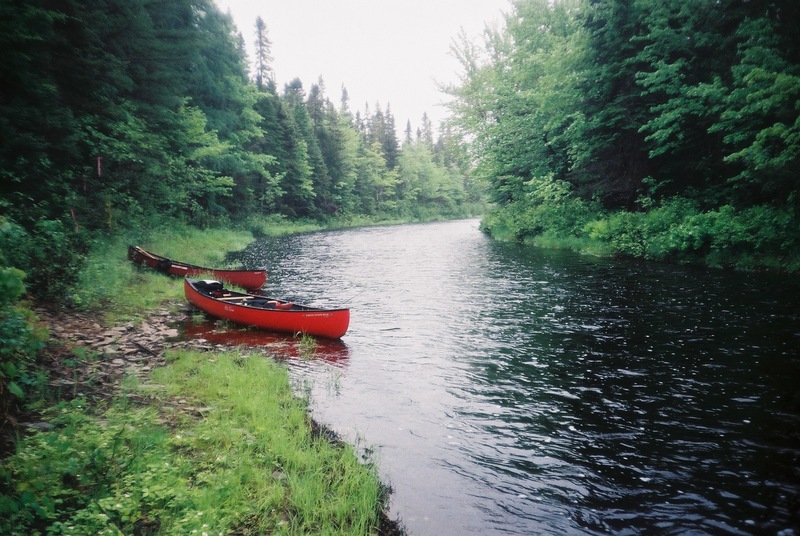 The river also served as a highway of sorts, linking the St. John and Nepisiguit rivers via a portage trail between Nictau and Bathurst Lakes. 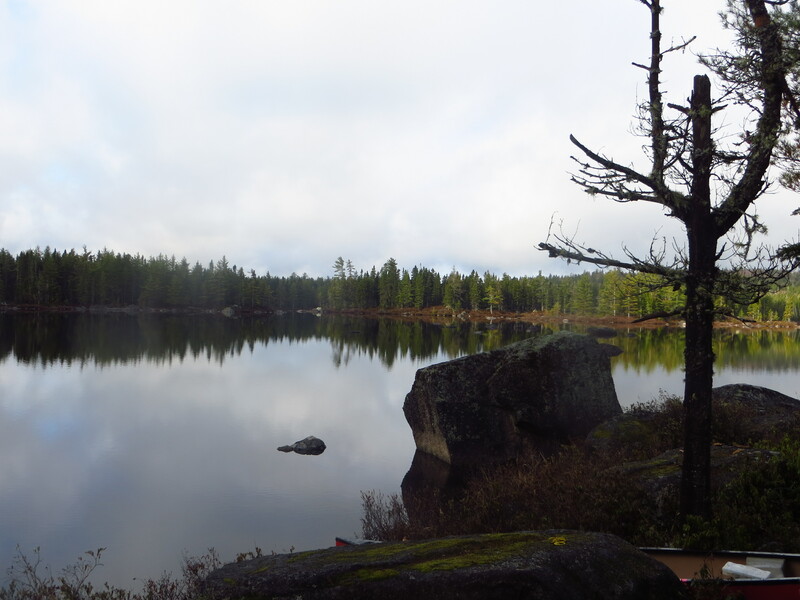 Mapped as early as the 1600’s — and developed by First Nations far earlier — hikers can walk the trail today in what is now Mount Carlton Provincial Park. On our first attempted ascent, a local outfitter questioned our sanity when Matt and I inquired about conditions in early May. 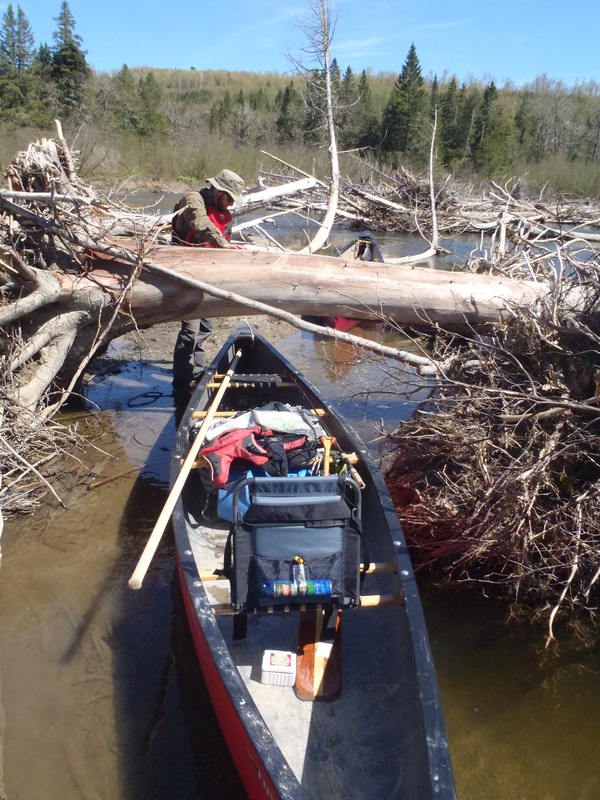 Stories of sweepers — a log blocking passage — and log jams scared us away. 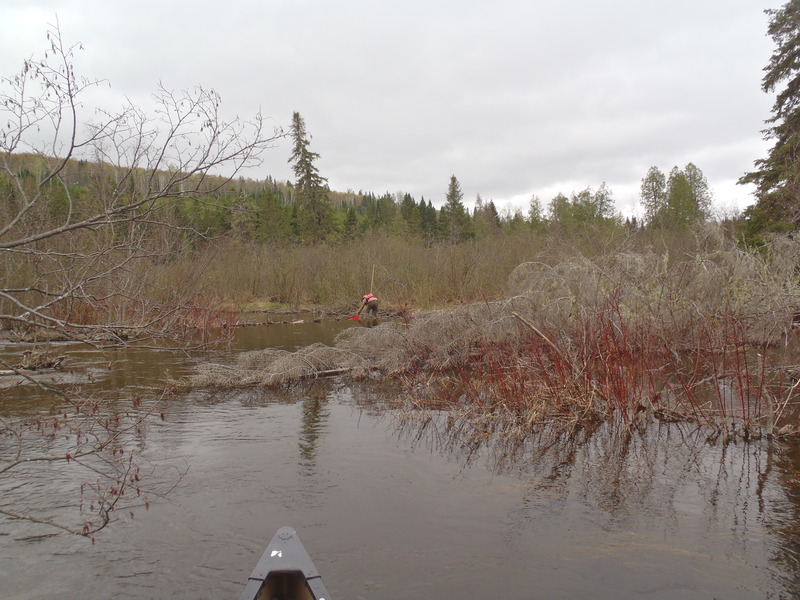 A year later, we decided running the Little Tobique in mid-May was manageable. People paddle the river all the time, after all. Regardless, I was anxious when we pulled into the Riley Brook General Store on a cool, mid-May morning. The folks at the store had arranged to shuttle us to our put-in — near Mt. 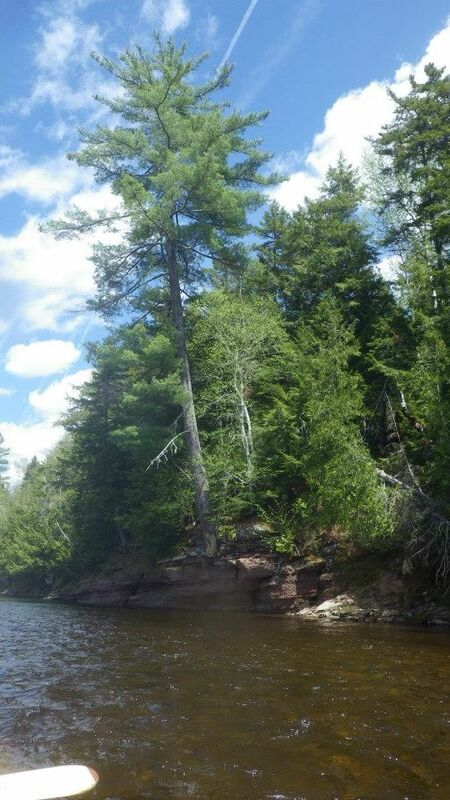 Carlton Provincial Park. At the put-in, the water was moving fast, but it was only 1-2 ft deep. I expressed my concern about the level to our shuttle driver, and he assured me that we would have a clean run. I later learned that the closest river gauge in Riley Brook read 2.32. 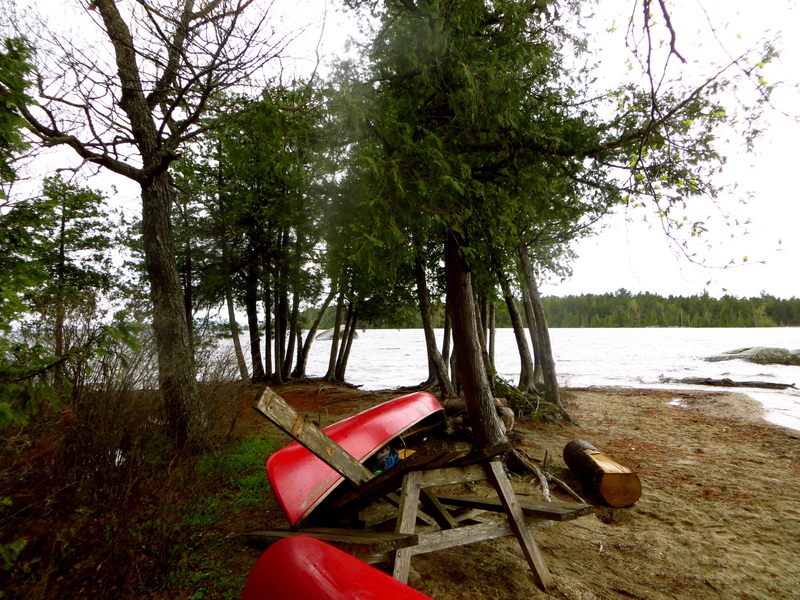 The scars of winter’s recent exit were evident as we slid our boats into the current. 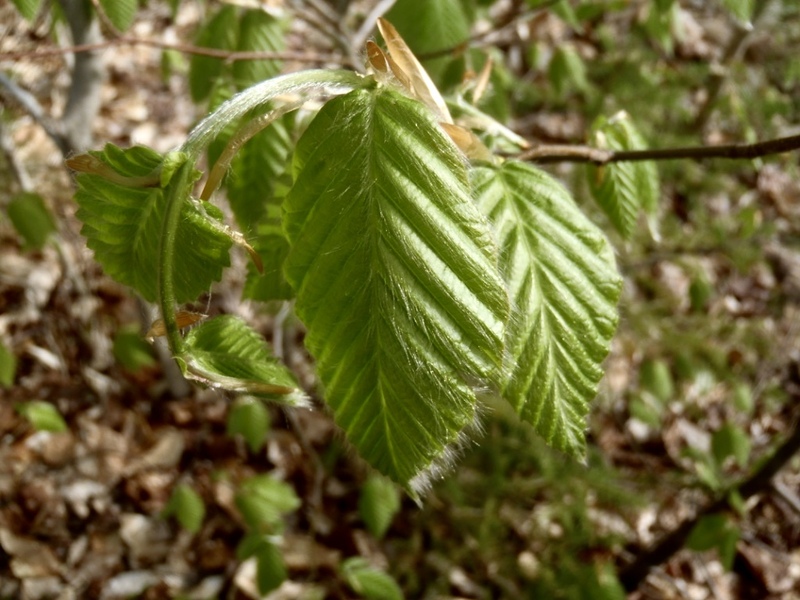 Without leaves on the hardwoods, the forest felt lifeless. Overcast skies blended with bare, grey branches giving the upstream breeze a chilling effect. Freshly fallen trees sat perched in the current, branches dug into the gravel river bottom, roots reaching back toward shore searching for dry land. It didn’t take long to reach our first obstacles, two established beaver dams. The dams caused the river to branch out into dozens of little channels. Finding clear passage proved difficult. 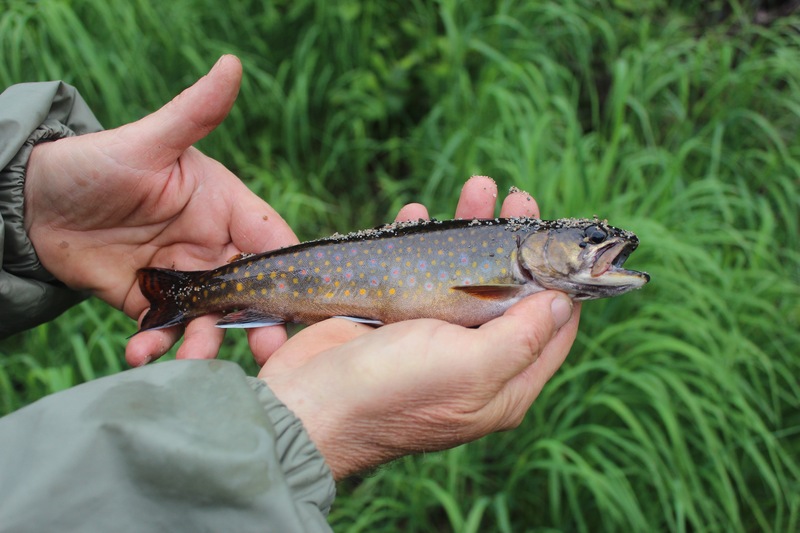 Promising channels ended in alder swale barricades. I came face-to-face with a confused bull moose in one of the swales — we were both tempted to ask for directions, but being males, we continued on, half lost. 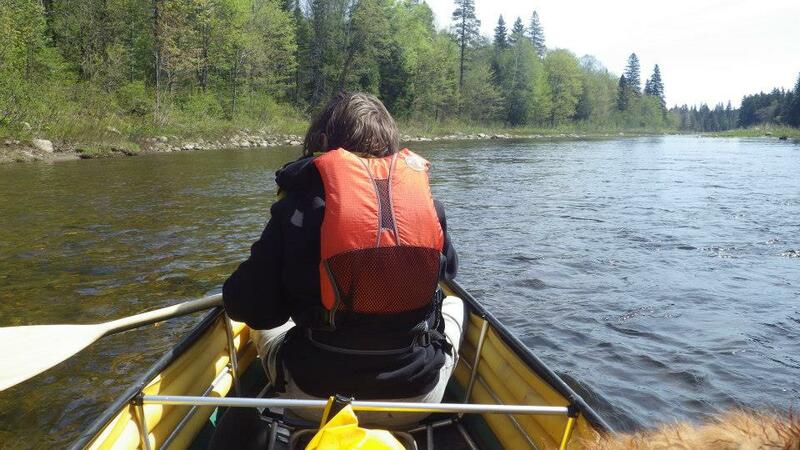 The river was a technical challenge despite a lack of rocks or rapids. Miss the inside eddy on a meandering turn, and you’d tangle with a sweeper on the outside bank. Get too close to a logjam, and the current may pull you underneath. The sun emerged in the late afternoon as we set up camp. 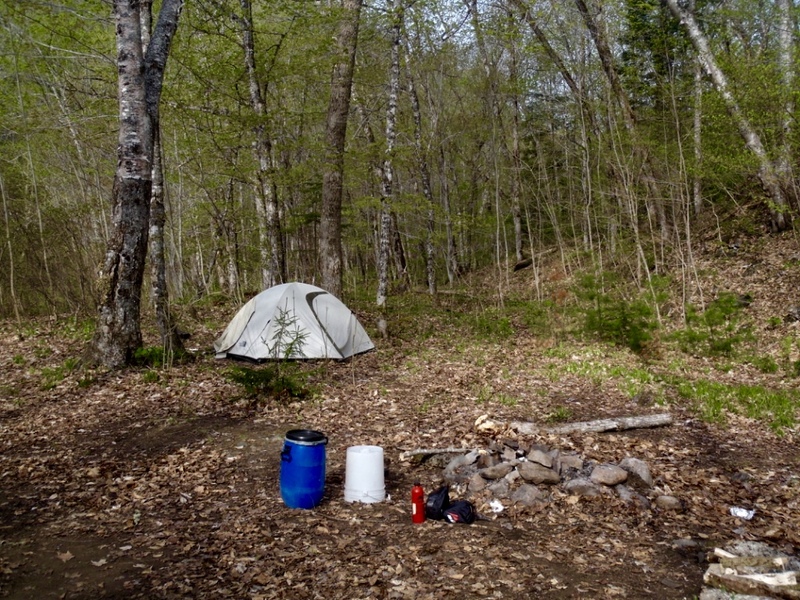 Our campsite was on a gravel deposition on the inside of a tight corner. It offered no cover. 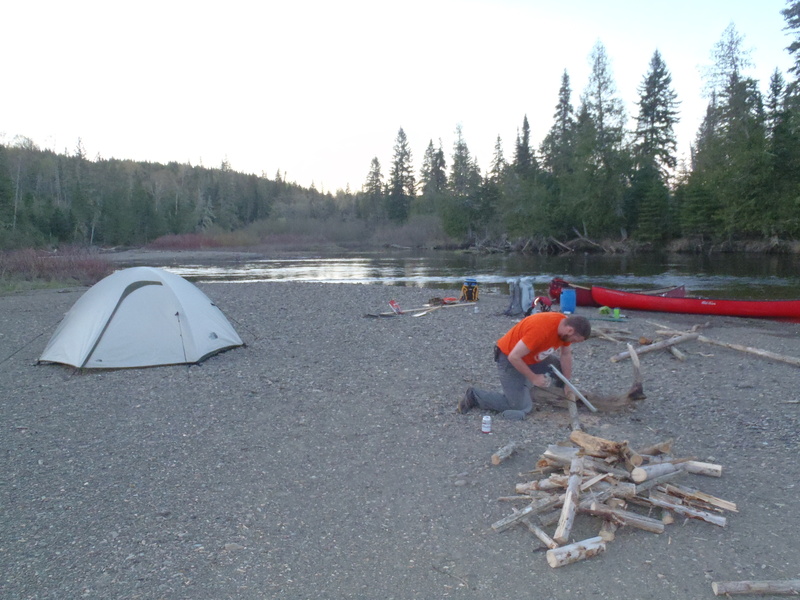 We built a fire-pit from soaked driftwood because the area was devoid of large rocks. Damp gravel underfoot suggested the area was recently underwater. Conditions were frigid in the morning. Thick frost covered the boats and our water was frozen. There was no need to cover a great distance so we relaxed. 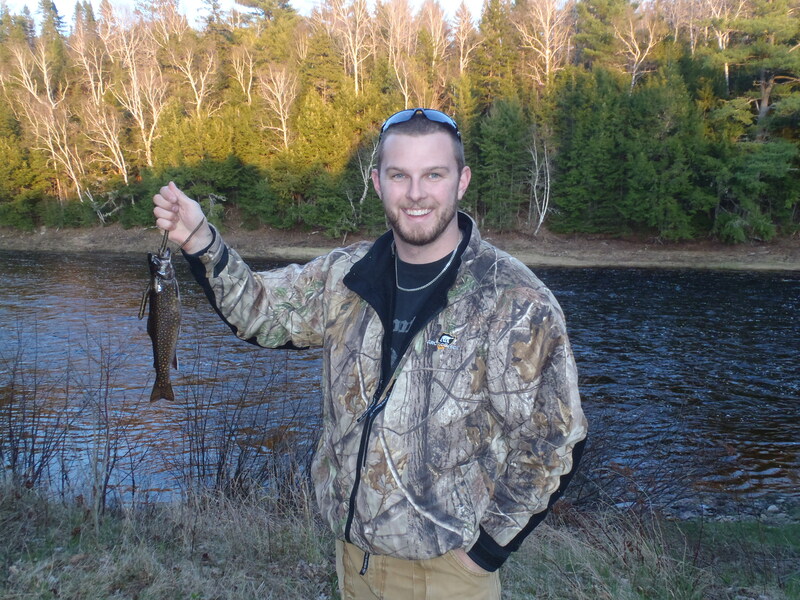 Matt landed a couple small brook trout, while I sat by the fire in the sunshine, drinking coffee. We hit the water around 1 p.m., and throughout the course of the day we encountered several logjams, carrying around two of them. Many of the jams were well established — and likely have been for a long time. 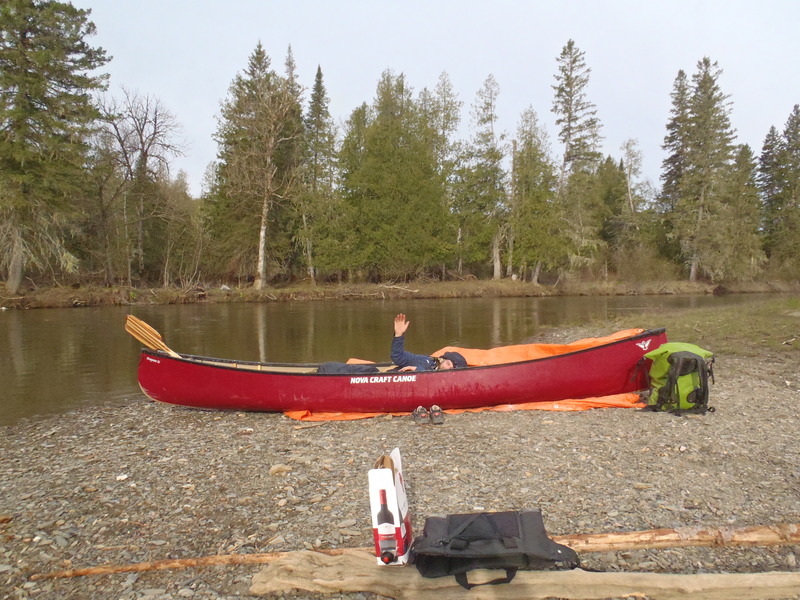 I learned an important lesson about water depth near logjams. I approached a shallow arching turn where logs had entrenched themselves, forming a small jam. 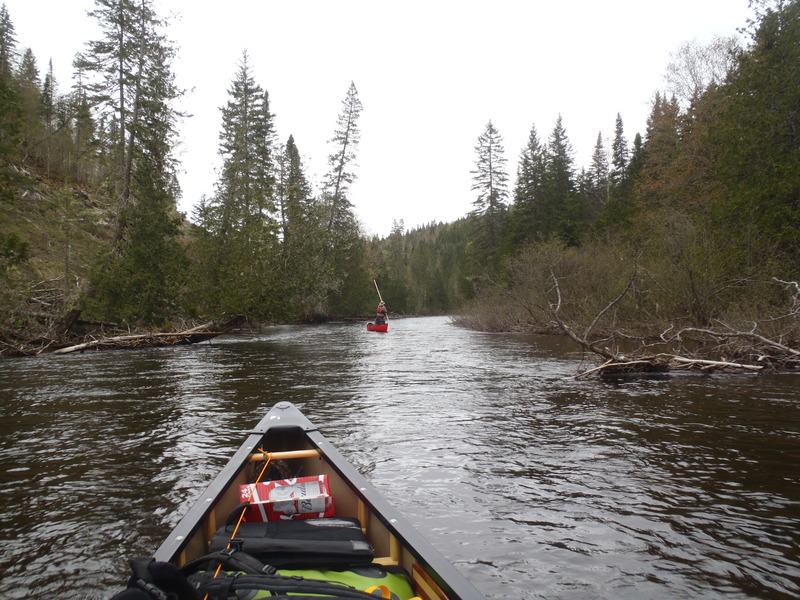 In an effort to avoid a portage, it seemed prudent to inspect — what looked like — a canoe-sized opening in the jam on the far bank. With my snubbing pole in hand, I approached with extreme caution. As I neared visible range I thrust the 12 ft pole into the tea-colored water and the familiar crunch of gravel was strangely absent. The bottom had dropped away. The pole traveled downward until my hand was at the water line. 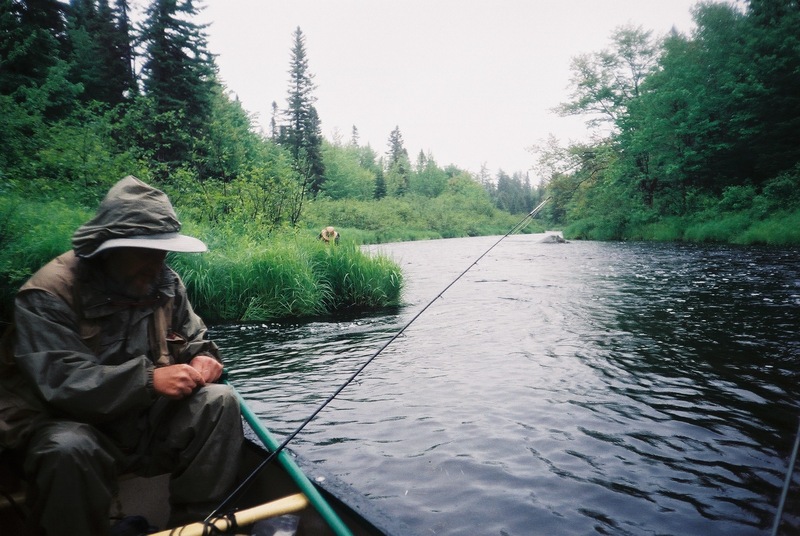 Shocked and off-balance, I tossed my pole into the bow, sat down, grabbed my paddle and ferried into a nearby alder swale. As it turned out, there was no opening, and I — rather shamefully — had to walk the boat upstream. We elected to set up camp shortly after. The site was on another gravel deposition on what is likely a floodplain. To say it was flat is an understatement. The ground under our tent, 30-40 ft from the water, was roughly 2-3 inches in elevation above the flowing river. 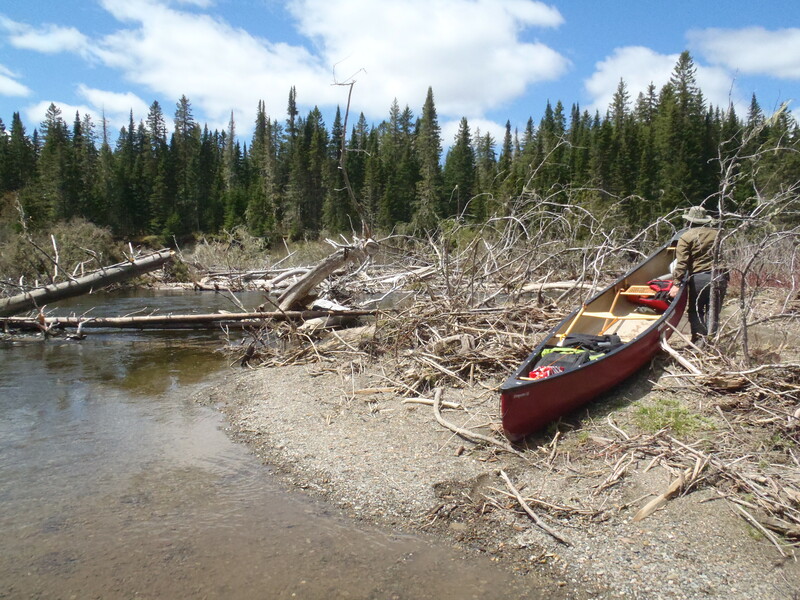 The adjoining forest was thick with alders, so we paddled to a grove of mature spruce across the river to get firewood. 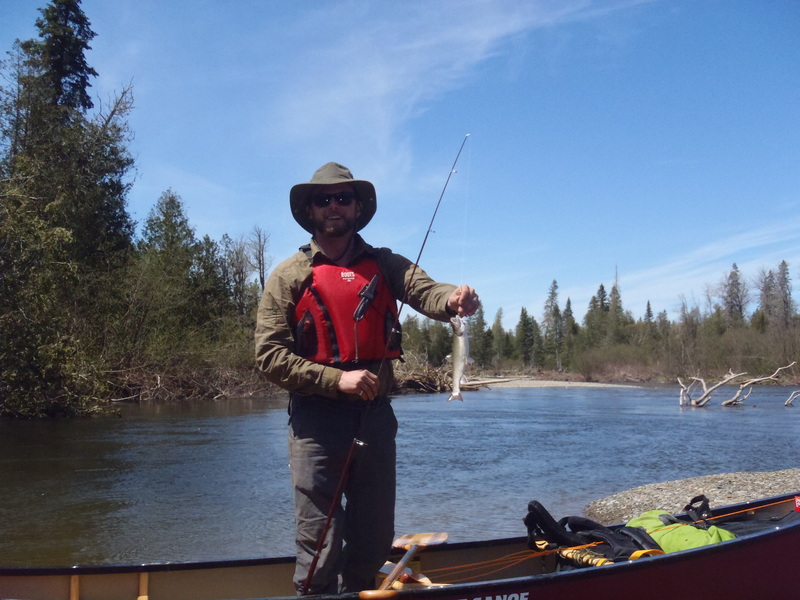 We spent the bulk of our third day fishing as we wound our way through more logjams. Pools at the base of jams were teeming with brook trout. 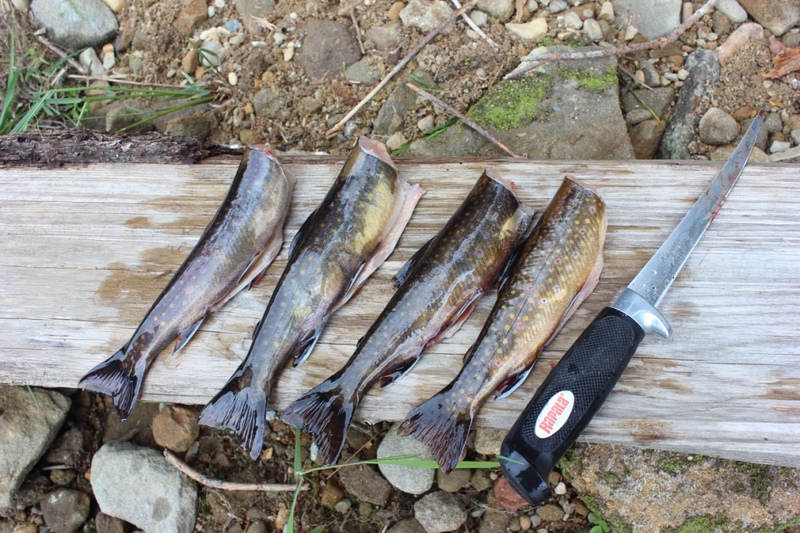 The fish were small — in the 6-8″ range — but plentiful. Similar pools further upriver yielded no result. 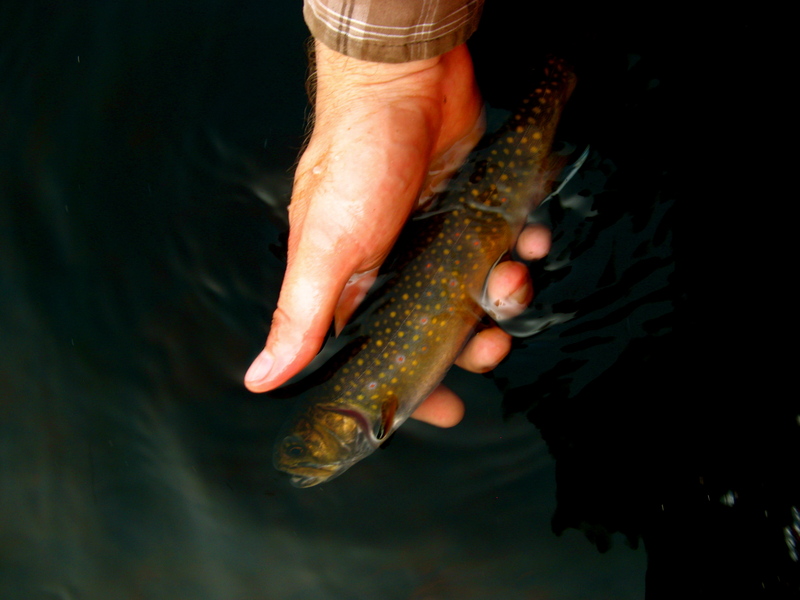 Who can explain the mystical nature of a brook trout run? 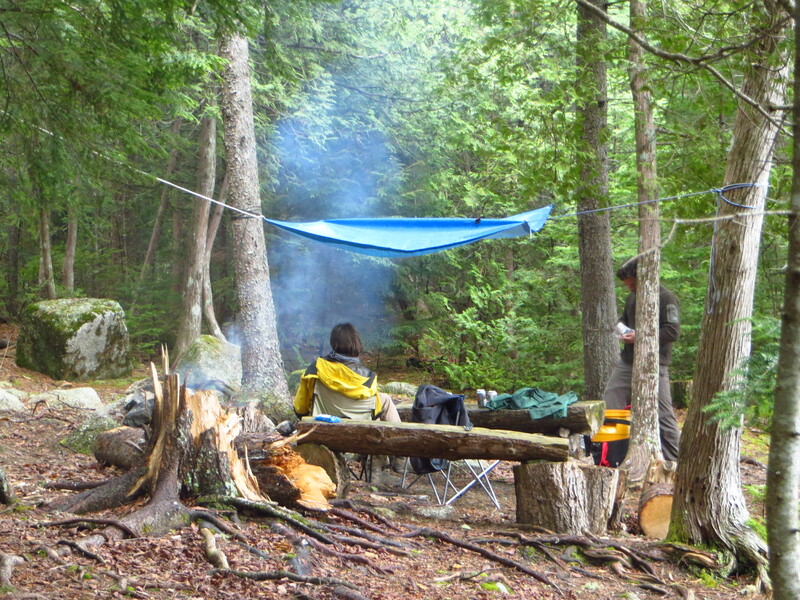 There’s an access point and campsite at the bridge located a few kilometers below our second campsite. This point would make a good put-in for those looking for a one-day trip. By mid-afternoon, we were feeling the effects of two days of sunshine. Unfortunately for us, shady spots were in short supply. 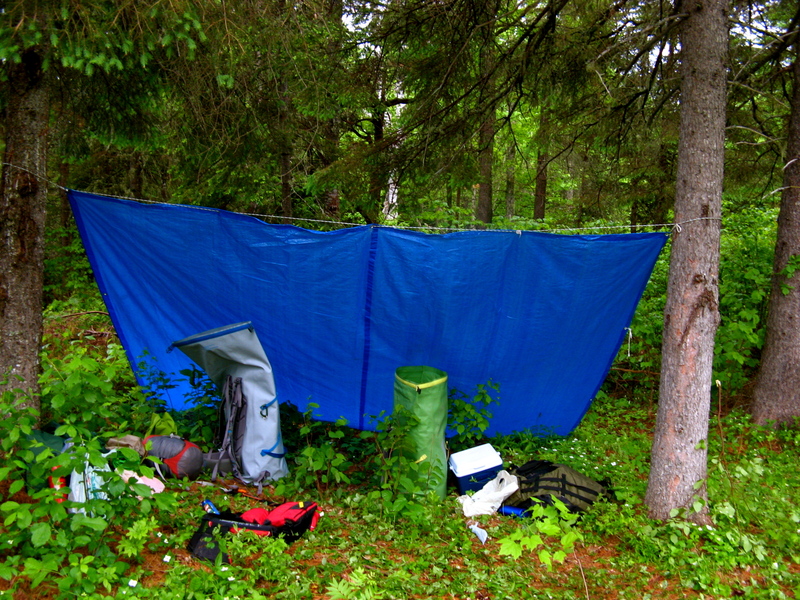 With an air of desperation, we pulled onto a gravel bar and rested under an ad hoc shelter of tarp and paddles. Feeling comfortable, we decided to set up camp. The gravel was finer than the previous night, suggesting the current was slowing down. The river, however, displayed no signs of reduced power as it flowed past in silence. Logs of different sizes had collected along the far bank as the river folded back onto itself. 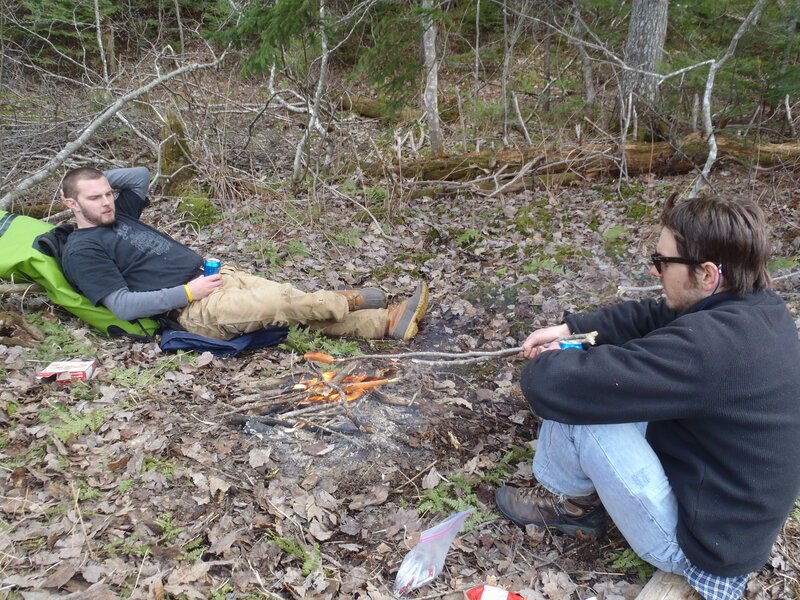 With the trip nearly complete, fireside conversation drifted between what’s to come and has been. Connections to past travelers became real. It was a privilege to travel a waterway that W.F. 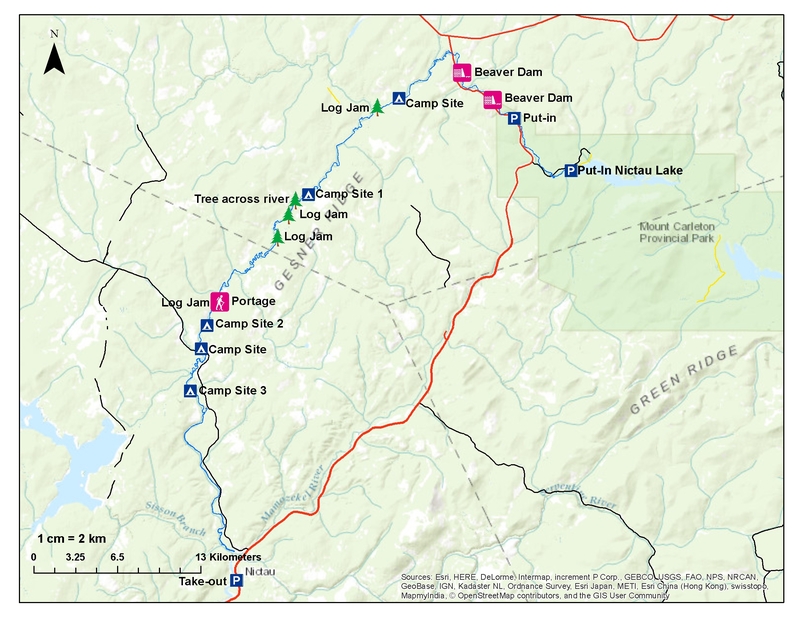 Ganong declared “one of the most important routes across the province.” A route that Maliseet and Mi’kmaq people used for thousands of years. Where 19th-century guides brought their aristocratic ’sports’ during New Brunswick’s tourism golden age. 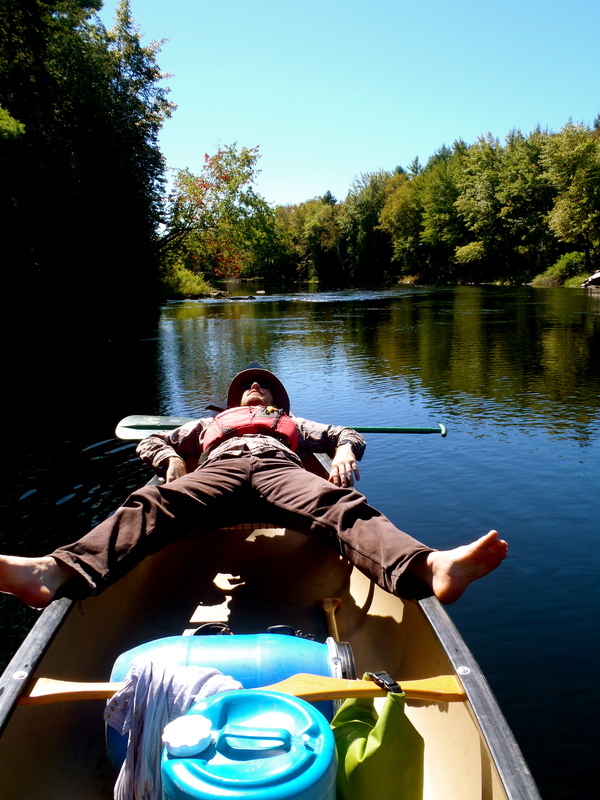 Ever the innovator, Matt decided to sleep in his canoe on the final night. 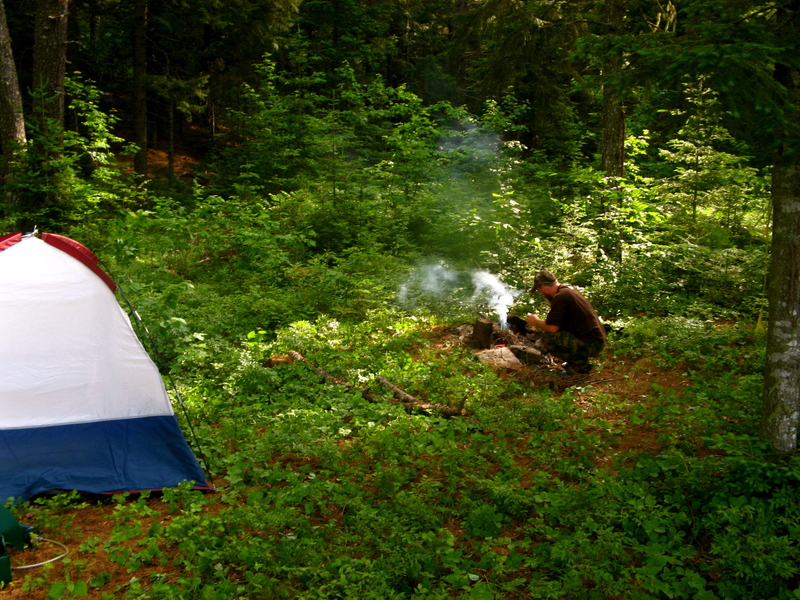 An idea I supported for no reason other than I welcomed the extra room in my two-man tent. After a spacious sleep, I was up and eagerly awaiting this photo op. We were on the water early on our last morning. 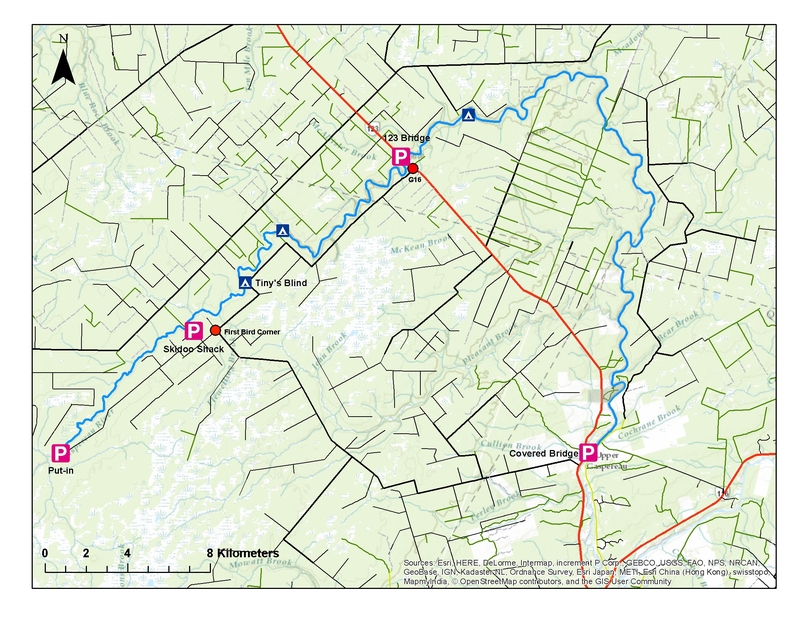 The final leg was just over 25 km — 12 km to the confluence of the Little and the main Tobique Rivers, and the remainder on the main Tobique. 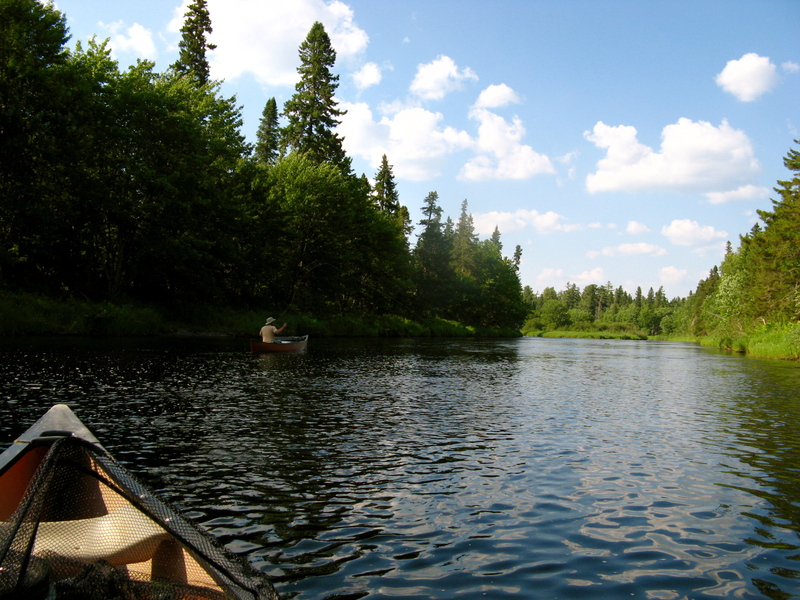 The Little Tobique straightens and widens as it approaches its mouth. With logjams no longer a concern, we expected a dull paddle. But, the beauty of the river valley took us by surprise. Large spruce line the towering valley walls as they slope toward the river. 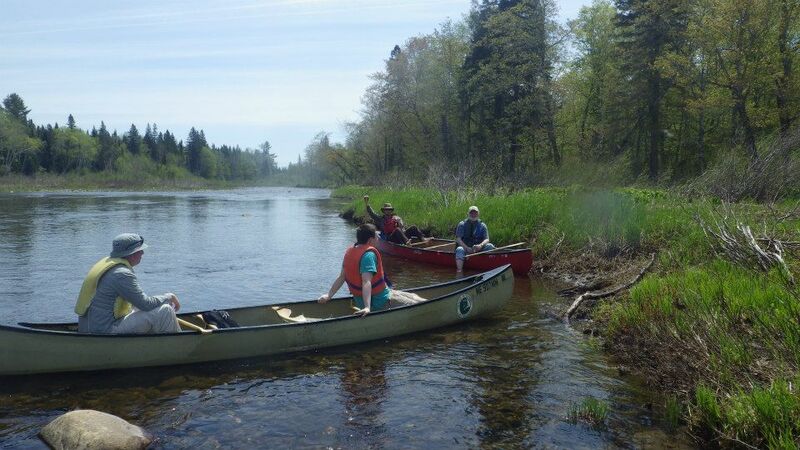 To paddle from Riley Brook to Nictau is to experience these communities as intended. 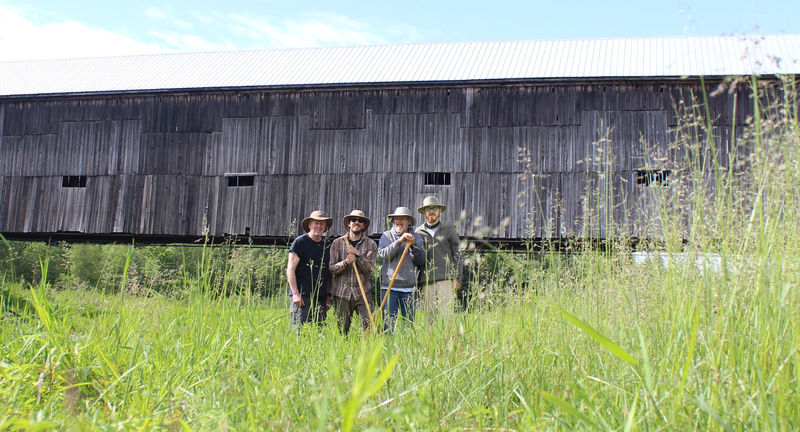 As we passed through, a small group of locals hunched over on the soft river bank picking fiddleheads. Canoes built by Miller and Chestnut adorned the shoreline. 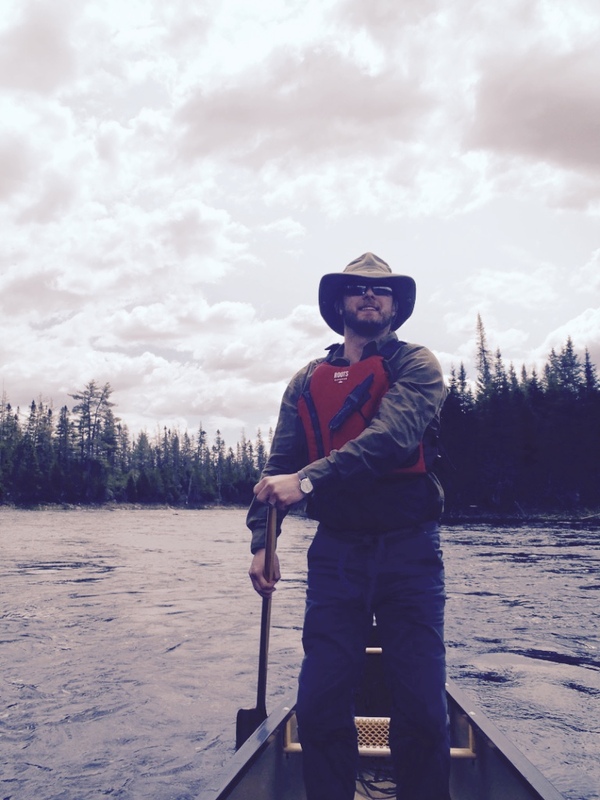 Life on the Tobique, it seems, maintains a natural rhythm much like it has for thousands of years. 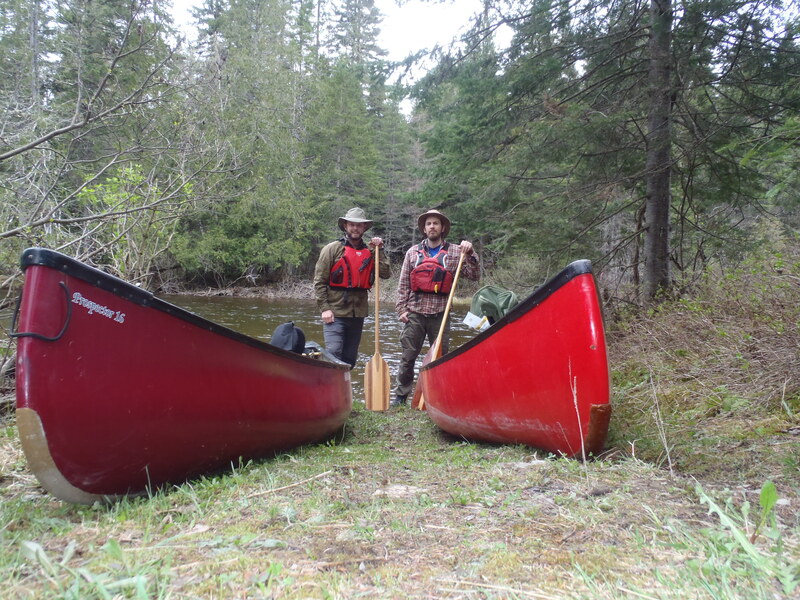 The May long weekend is sacred for a lot of canoeists: It’s the first paddling-eligible long weekend of the year. 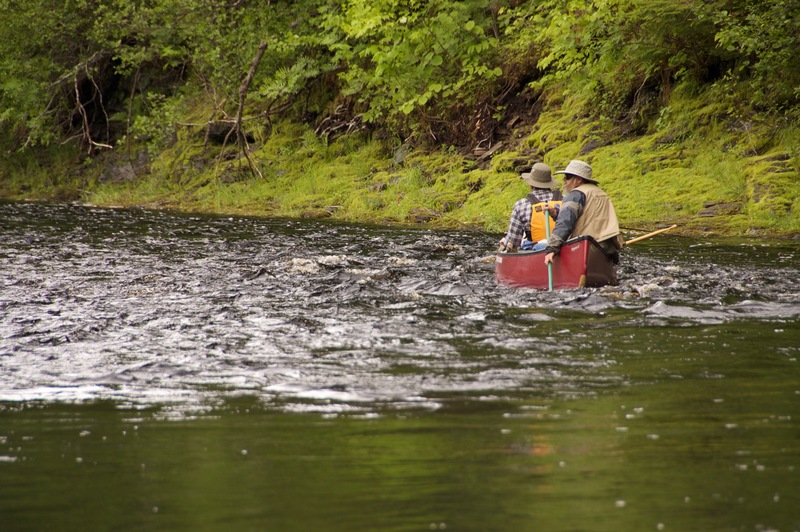 Paddlers face cool air and water temperatures, but are rewarded with an insect-free woods. 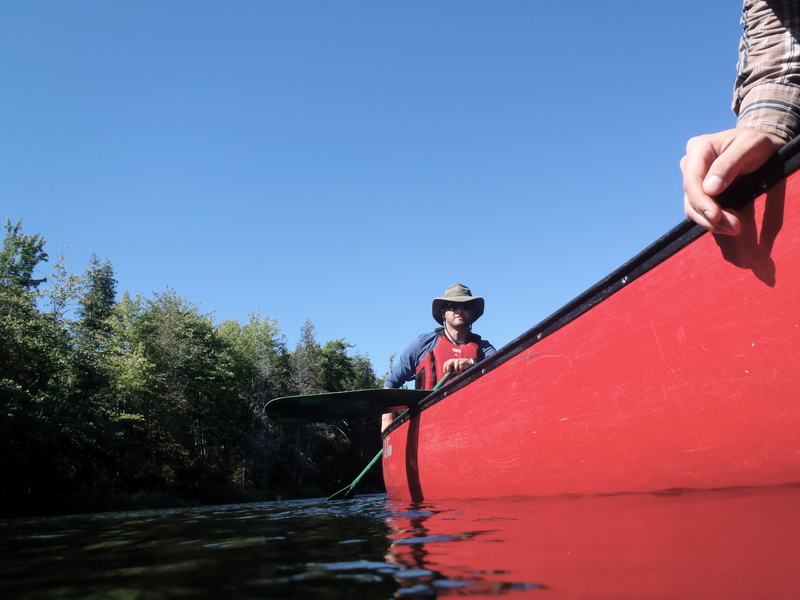 This year my friend Shane and I were headed into the Kennedy Lakes Protected Natural Area in central New Brunswick. 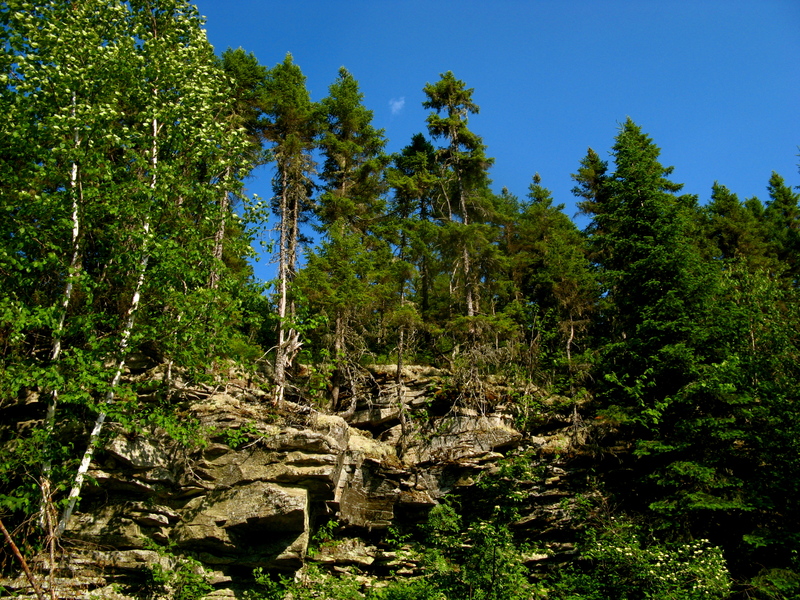 The 207 square kilometer area was exempt from industrial activity when New Brunswick established its Protected Natural Areas Act in the early 2000s. The series of small lakes in the area comprise the headwaters of the Renous and North Renous Rivers. 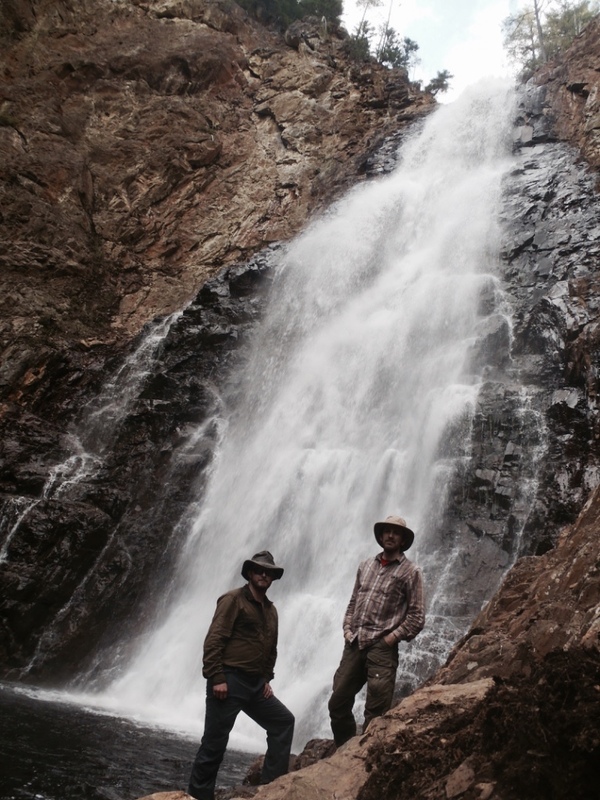 Our goal was to try and access either Lower or Upper Kennedy Lake. Unfortunately, from a tripping perspective, little information is available on the region, aside from the fact that it is notoriously difficult to access. 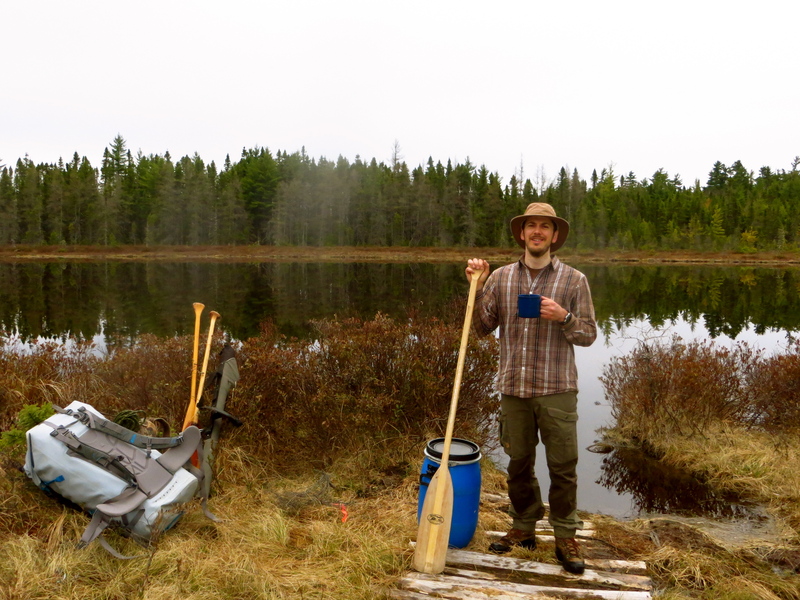 New Brunswick is famous for its road density — it’s often said that there are few places not accessed by vehicle — so it seems fair to say that the Kennedy Lakes are among the most remote in the province. 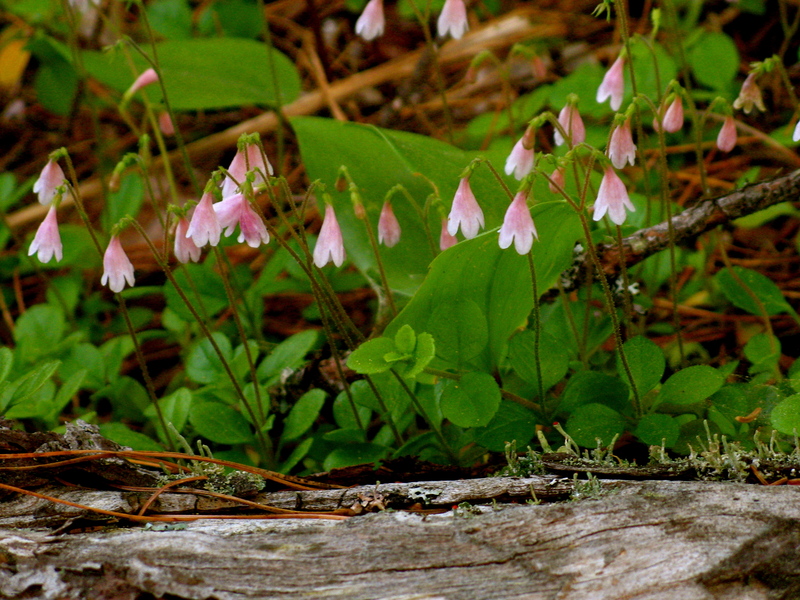 Aerial photographs from GeoNB indicated that access could be achieved via an old logging road off of Route 108 along the southern boundary of the protected area. The road would take us to within 500 m of Second Fowler Lake. Second Fowler is adjacent to Kennedy Lake, and at their closest they are a mere 300 m apart. 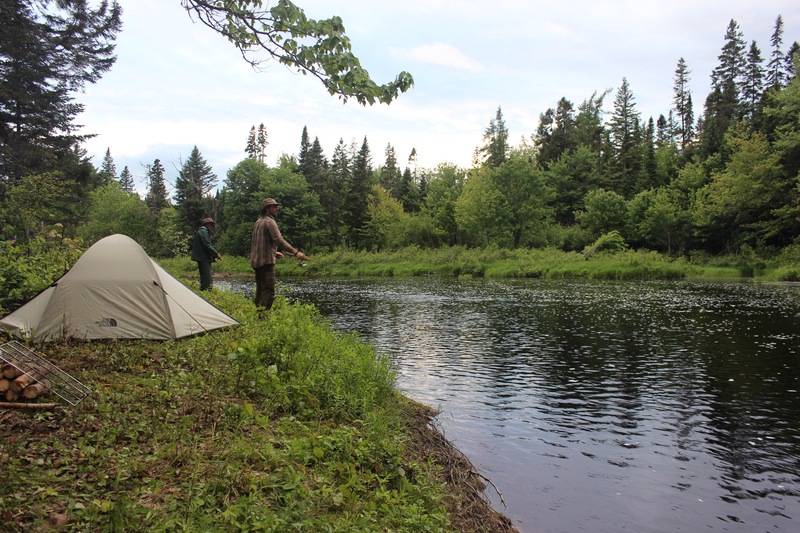 Through some additional research, we learned that the Miramichi River Environmental Assessment Committee had established a portage trail from the end of the access road into Second Fowler Lake. However, a DNR ranger suggested that the chance of the road being passable was 50/50 with a truck — which was fine because I have a truck. Or so I thought. While driving through Blackville the battery voltage on my old Mazda B2500 started declining rapidly, engine shutdown appeared to be imminent. Fortunately, the old girl didn’t leave me stranded — she left me with just enough juice to reach Shane’s parents’ camp in Renous. After some fiddling with battery cables in the driveway, the voltage continued to drop. The alternator was dead, and so was the truck. Fortunately, Shane had gotten off work earlier than anticipated and made the last minute decision to drive up on his own ahead of me. The truck may have been dead, but the trip still had a faint pulse. With DNR’s advice in mind, a sense of apprehension filled the car as it pulled onto the decrepit access road late Friday evening. 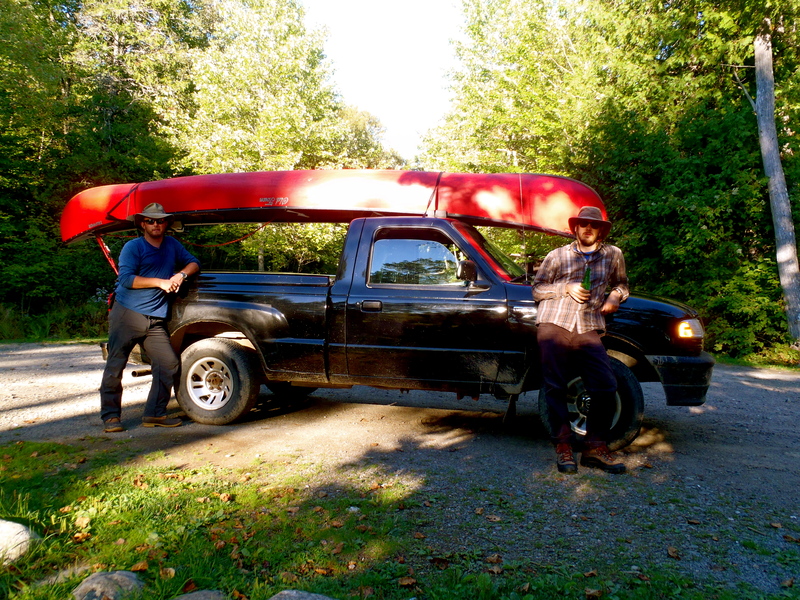 My Old Town Discovery was strapped to the roof and the question that lingered was, how far were we willing to portage? The road was relatively solid. After dodging sharp rocks, cutting back fallen trees, and bridging deep ruts we arrived at the trailhead around 6:00 p.m. only to find a vehicle parked there. Discussion immediately turned to whether or not this could be a local beer drinking hole — did I hear banjos? 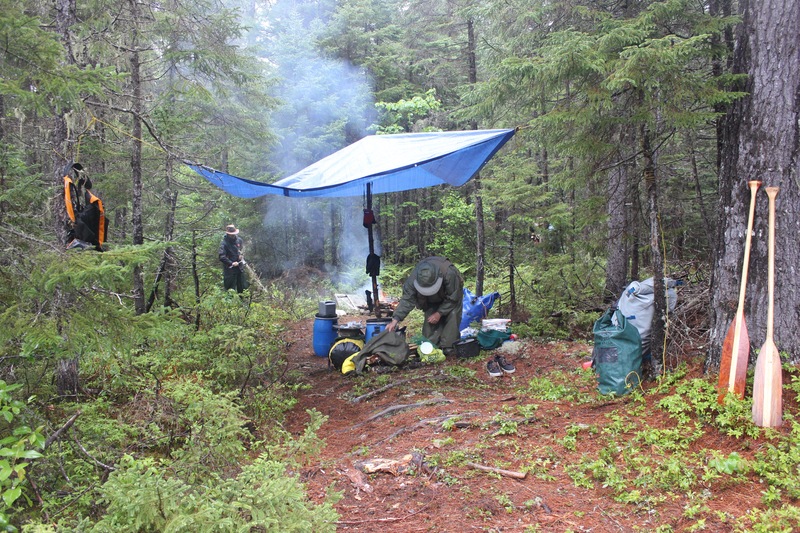 It appeared as though the occupants of the vehicle had gone tripping, so we elected to setup camp at the trailhead and begin the portage in the morning. 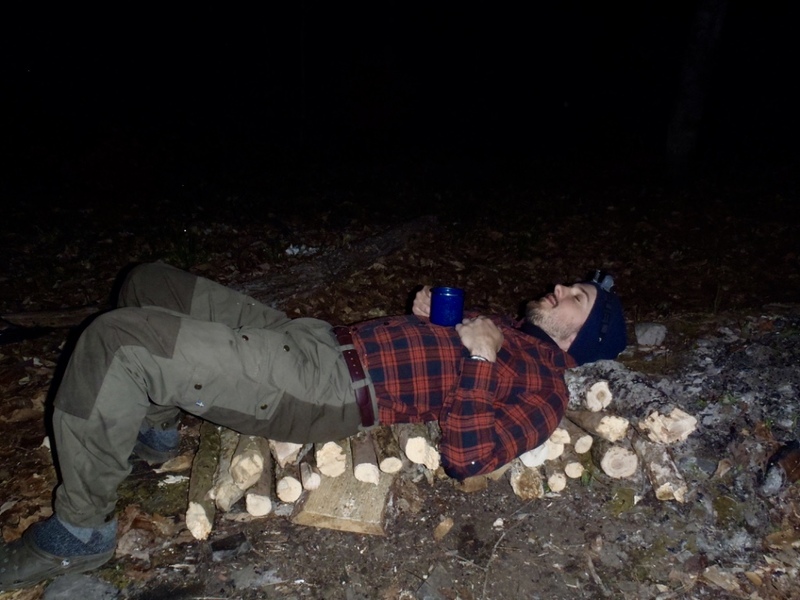 After a small campfire, and talk of all the trout we were sure to catch, I dozed off to the calls of spring peepers and enjoyed a night full of dreams about expensive repair bills. What truck? 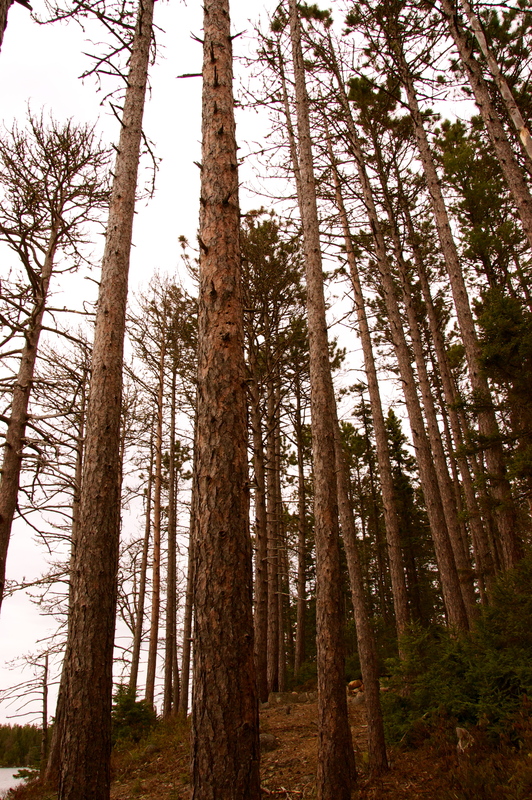 The portage trail was well marked and — mostly — easy walking through dense fir-spruce woods. Snow still covered the trail in many places. The boardwalk installed to prevent damage to the wetland on the last leg of the trail has mostly fallen into disrepair. Missing and/or broken boards caused us to slip into knee-deep mud several times. 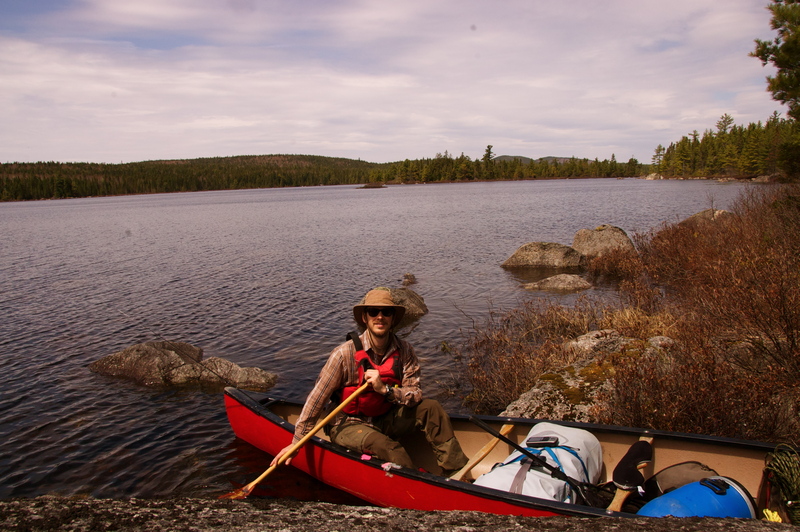 At 90lbs the Old Town Discovery 169 is not built for portaging so, for Shane, Second Fowler Lake was a welcome sight. At its deepest the lake is only 3-4 ft but the bottom is covered with layer of mud/sediment equally thick. Conditions were serene, the water was smooth as glass, the sun was shining, and the call of the white-throated sparrow echoed across the lake. 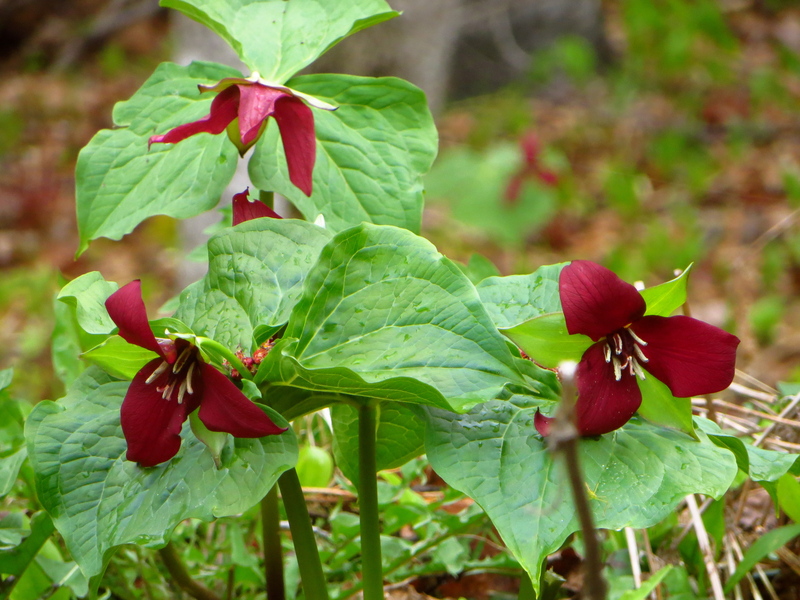 The surrounding area was low lying; clusters of pitcher plants lined the shoreline amongst the grasses, rhododendron, and black spruce. A portage trail into Kennedy Lake was located in the northwest corner of Second Fowler. Red blazes marked trees at the trailhead. The carry was unexpectedly easy, dry, and well marked. At the Kennedy Lake end, broken down old boats lined the shoreline near the trail, having long been abandoned by their owners. Kennedy Lake is long and narrow, but is still a relatively small lake at 2.5-3km in length. It’s much deeper and rockier than Second Fowler, reaching depths of up to 20ft in places. 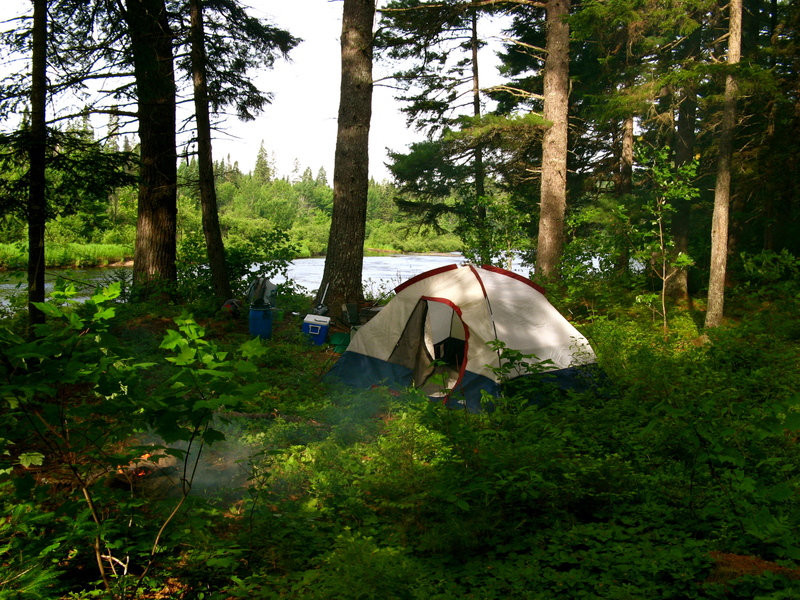 There are no camps or cottages on the lake, so it is surrounded by contiguous acadian forest. Sentinel white pines line the rocky shoreline at the south end of the lake, while small mountains flank the western side. 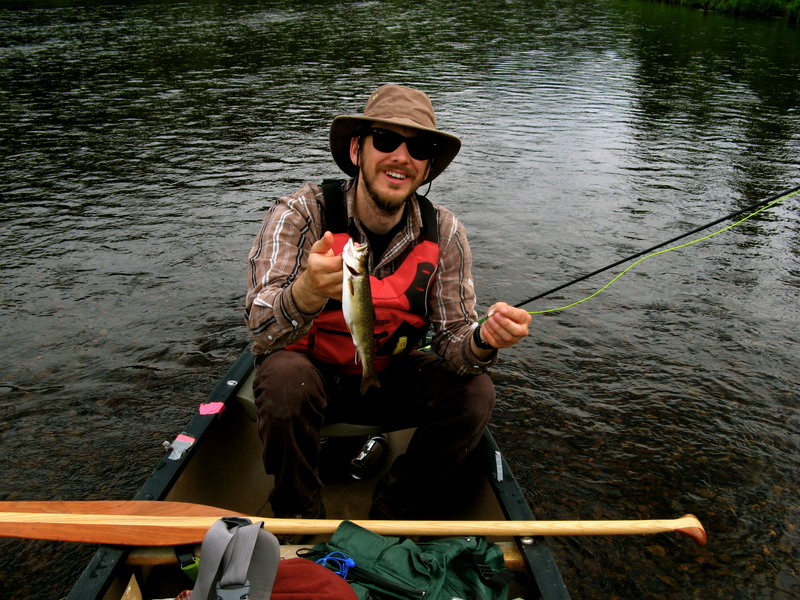 Immediately after launching from the put-in the shoreline drops away and the water turns black — surely teeming with trout. 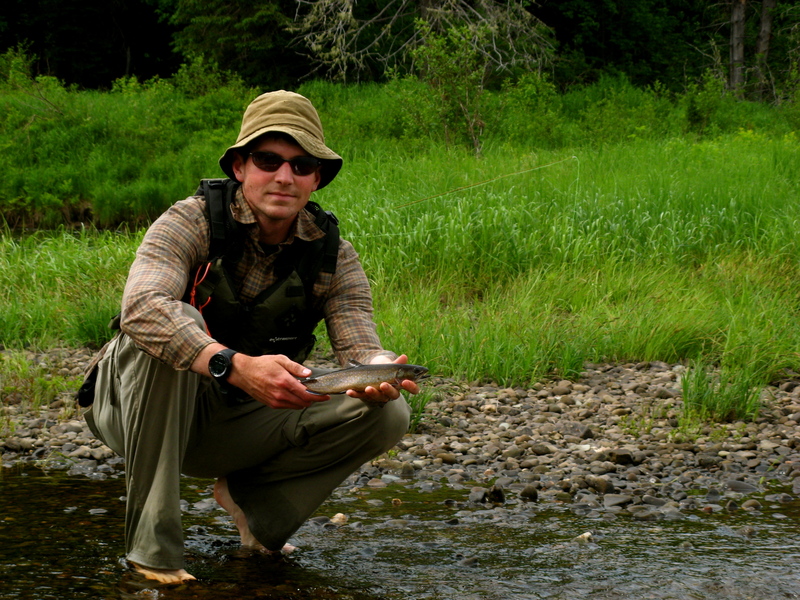 A few casts around the bay near the trail yielded no trout. It was around noon — a poor time for fishing — so it seemed like a good time to explore the lake and look for a campsite. 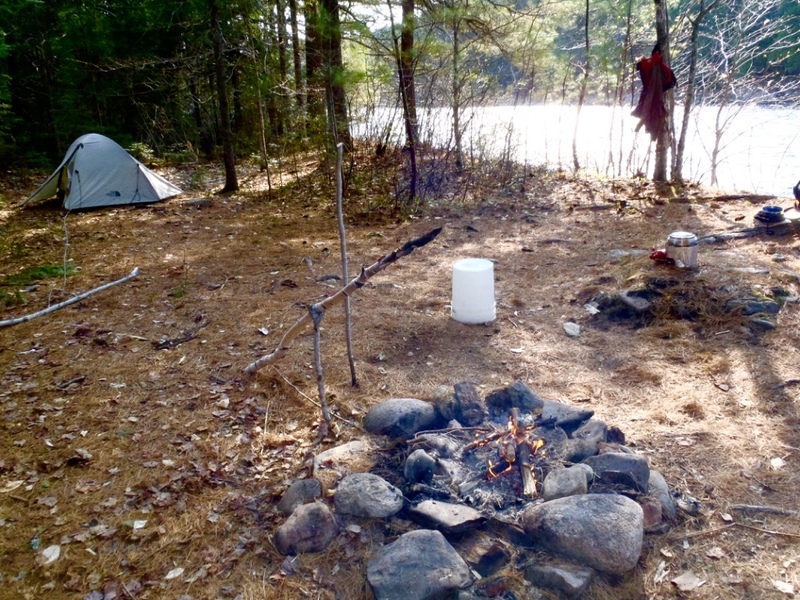 The DNR Ranger suggested a single campsite existed in the northeast corner of the lake, and to us this seemed like logical destination. 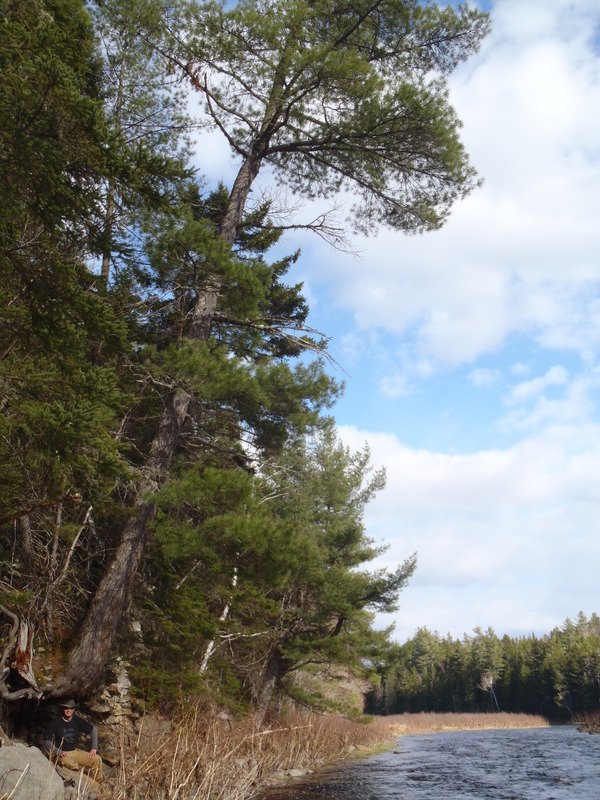 As we approached the island in the centre of the lake our solitude was disrupted by — of all things — a motor boat. It was irritating that our wilderness experience was disturbed but the irony was not lost on us. 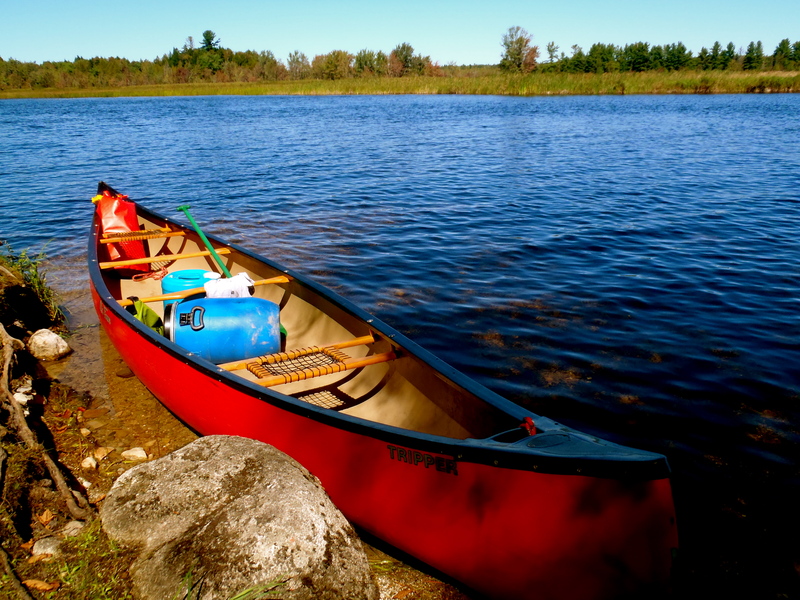 There’s something funny about not wanting to put forth effort required to paddle around a lake, but simultaneously being willing to carrying a boat and a motor across portage trails. 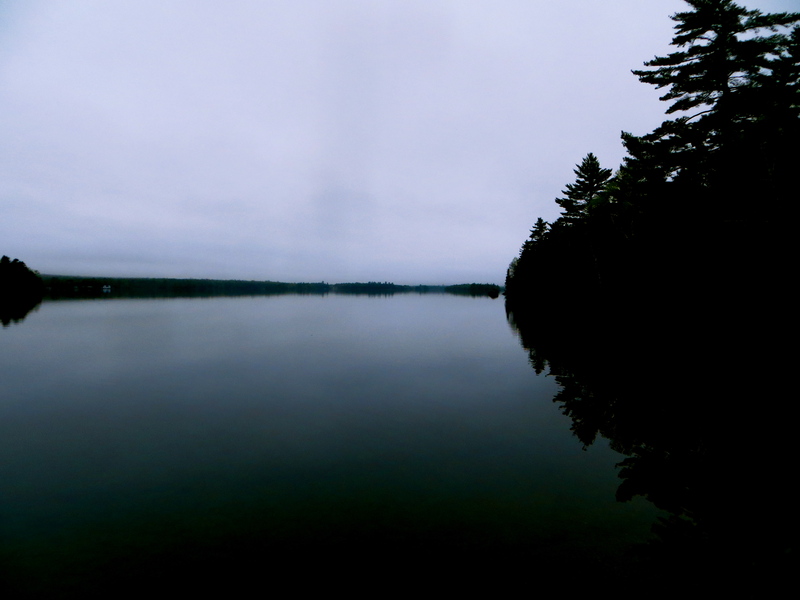 With another boat on the lake our fears were realized, the lone site was occupied. What was once a nice site exists on a nearby point, but something had killed all the red pine and it was now a widow makers paradise. The former site was — predictably — covered in burnt out old frying pans and pots. 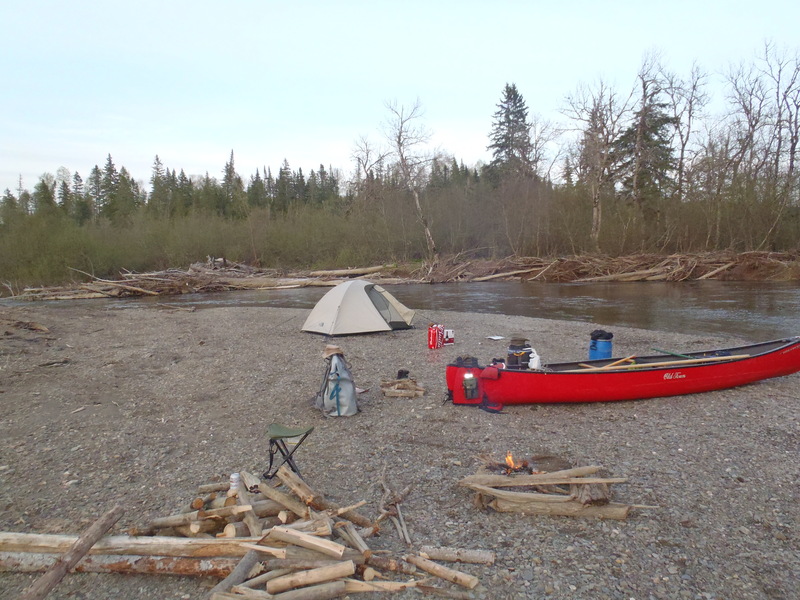 Without a campsite we resolved to paddle the shoreline in search of a flat place to put a tent. Flatness was in short supply — most of the shoreline was rocky and covered in thick Leatherleaf (Chamaedaphne calyculata) bushes. Eventually we stumbled upon the portage into Upper Kennedy Lake near the northern river inlet. The trail leads to a short paddle across a small pond before continuing northward toward the lake, certainly worth exploring but it was not in our immediate trip plan. After circling back to the put-in at the south end of the lake we ended up on a sloped site at the mouth of Lake Brook. 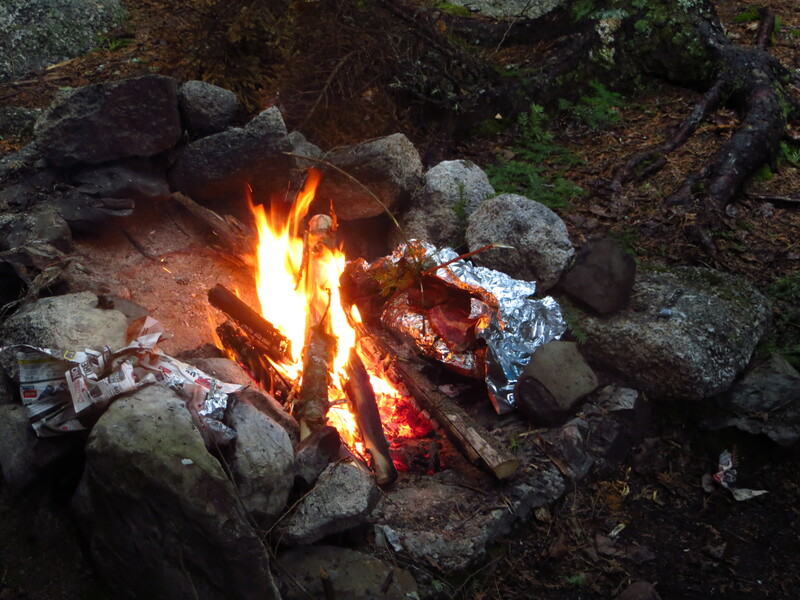 The site had plenty of flat rocks for food preparation and seating and appeared to be well-used — as evidenced by the burnt out pots and pans. A set of the falls at the mouth of the brook ruled out paddling further down stream, but the active water created a nice little fishing hole. 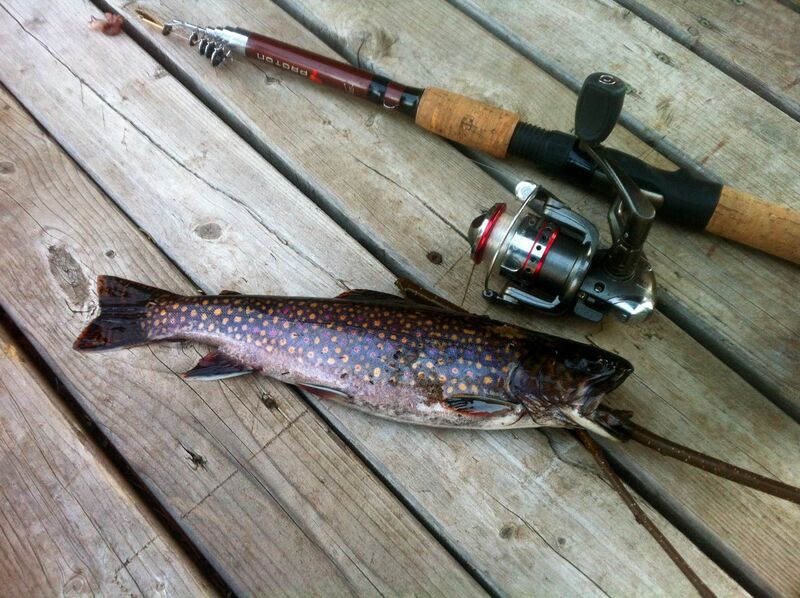 On my first cast from the shore I landed my first trout of the day — a little 6′ brook trout. 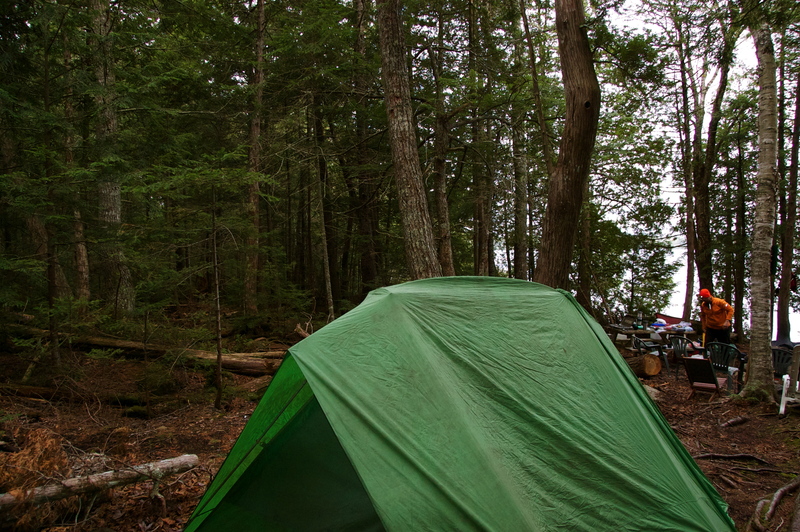 With morning came the sounds of raindrops hitting the tent. Inside the tent the gear was mostly still dry, however everything — including the occupants — had shifted a few inches down the slope. Outside the air was cool. A fine mist fell so lightly from the thick low-hanging clouds that the air itself felt wet. Steaming hot coffee with bacon and oatmeal helped ward off the chill. 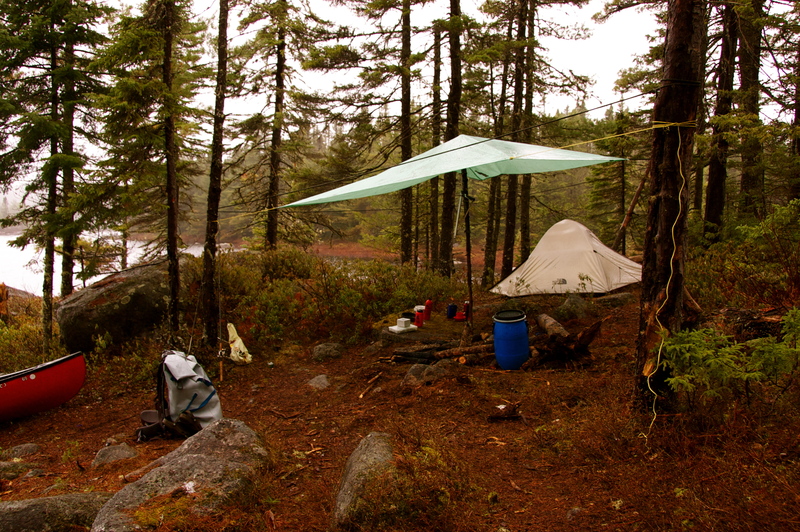 As if on cue, the rain began to fall immediately after breakfast — suddenly breaking camp seemed unnecessary and we committed to spending the day exploring the area. The banks of Lake Brook proved to be worth exploring. 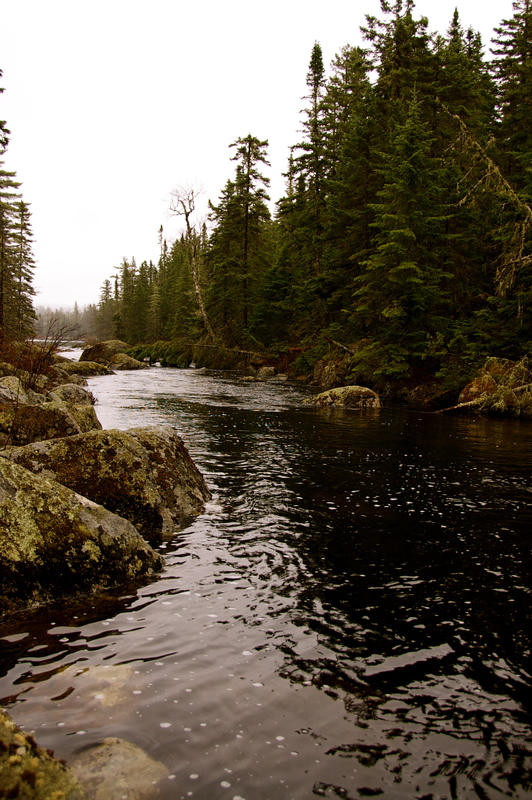 The dull skies gave the water a darkened tone as the last of the freshet flowed lazily through the pools after the falls. I stood on a large rock mid-stream and watched as small trout darted after my spinner as it worked its way across the current. The lichens beneath my feet, formerly dull and brittle, were plush and vibrant from the rainfall. My mind drifted to the source of two massive eyelets sunk into large, flat rocks on opposite sides of the brook — were they used to control the start of log drives in a bygone era or installed for more modern purposes? 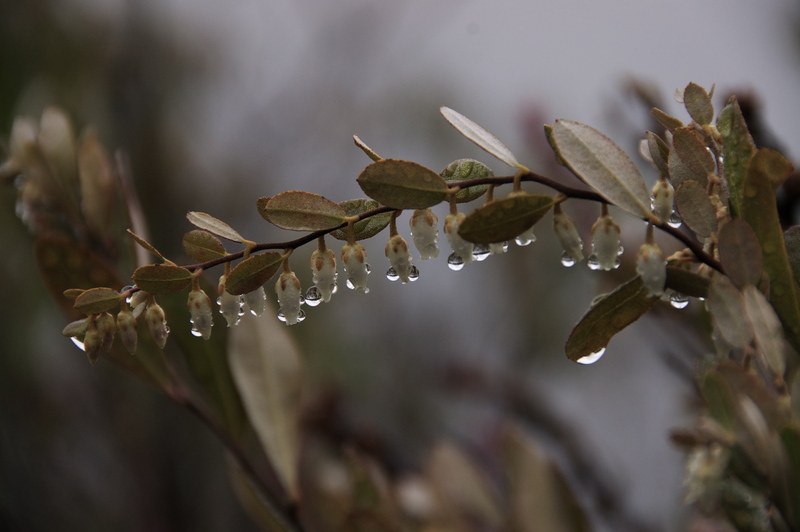 The rain continued through the afternoon. 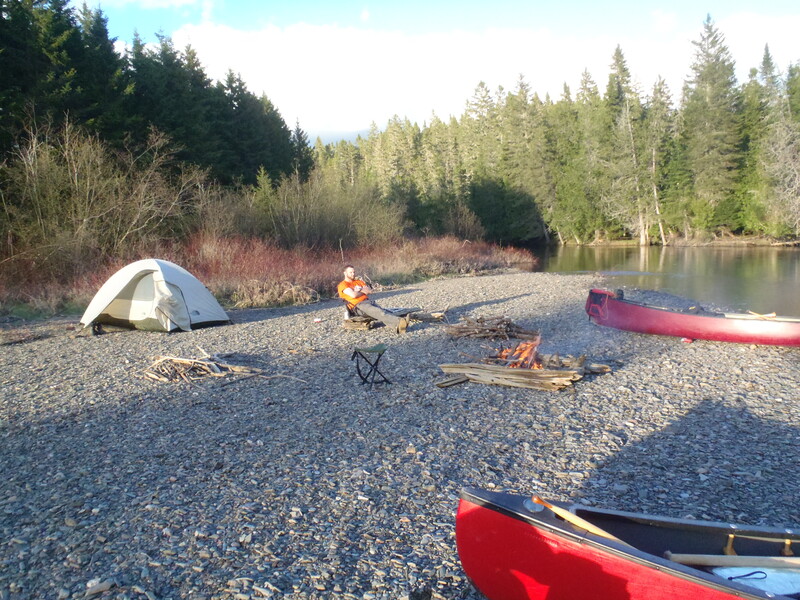 A short paddle around the island left us cold and wet and in need of a fire upon arriving back at the campsite. Storing wood under the tarp overnight proved to be a good decision. 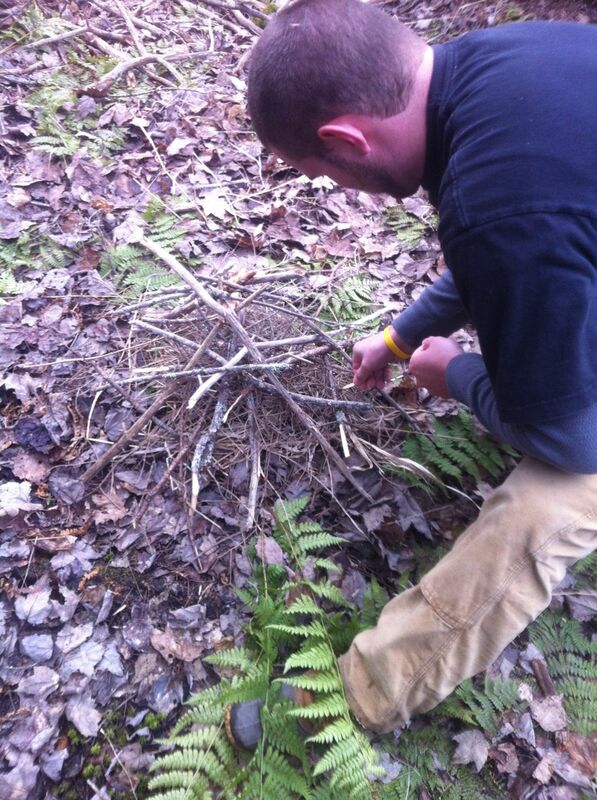 The dry material made starting a fire relatively painless. 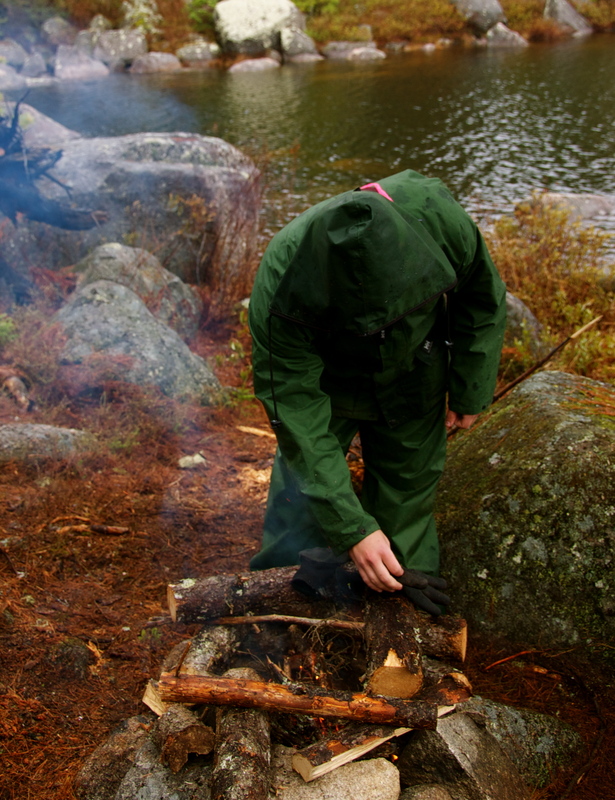 The need to start and maintain a fire in the rain justifies bringing an axe or hatchet on any trip. Regardless of the intensity of a rain event, roundwood logs will rarely be soaked all the way through, hence the ability to split logs and expose their dry interior can be crucial to maintaining comfort. 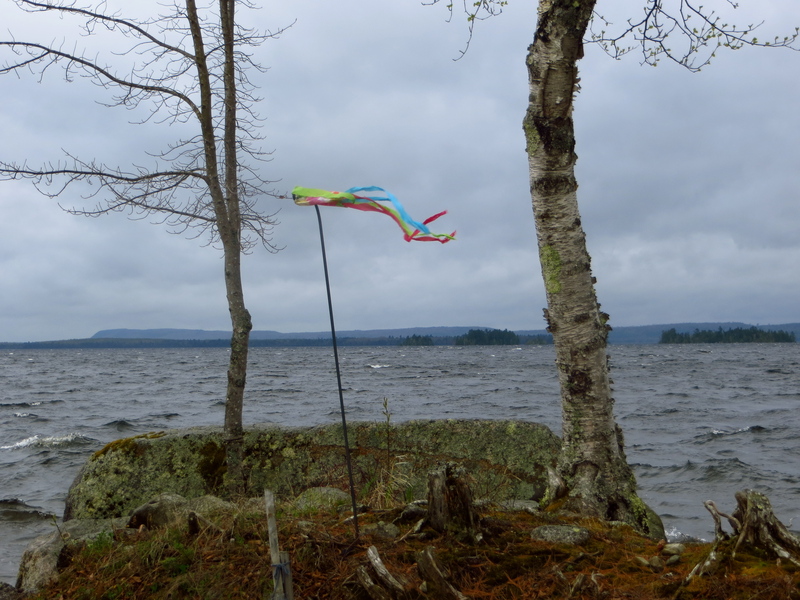 As we stood around the fire in our rain suits the wind picked up, and talk turned to improved weather on the final day. A fire helps dry out a couple of wet campers. The sun re-emerged the following morning after the last of the morning fog burnt off the hills to the west. 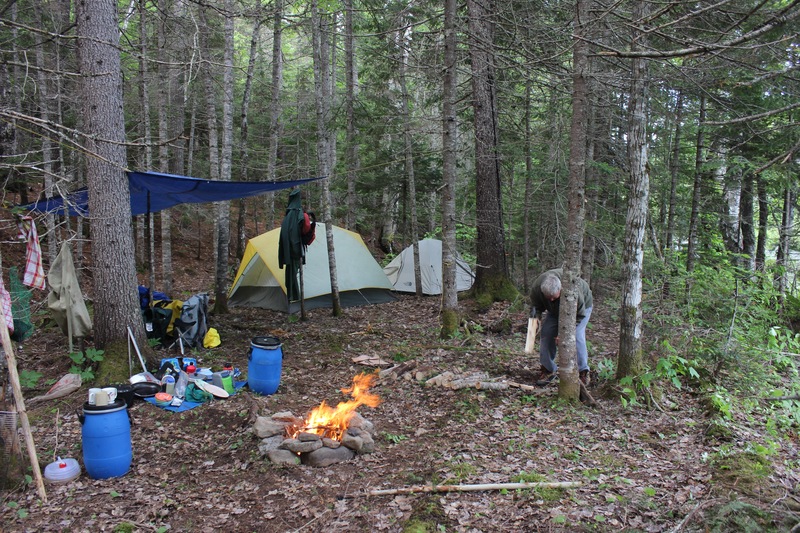 As we broke camp and made our way back across the portage trails to civilization my CAA membership status abruptly entered the forefront of my mind — had I paid my dues this year, how many kilometers were we from Fredericton? As it turned out, my dues were paid and the tow to Fredericton was completely covered. When we arrived back at the camp in Renous we enjoyed a celebratory beer in the sun and watched as my truck was loaded onto a flatbed bound for Fredericton. Certainly not the ideal way to end a trip, but it was better than no trip at all. 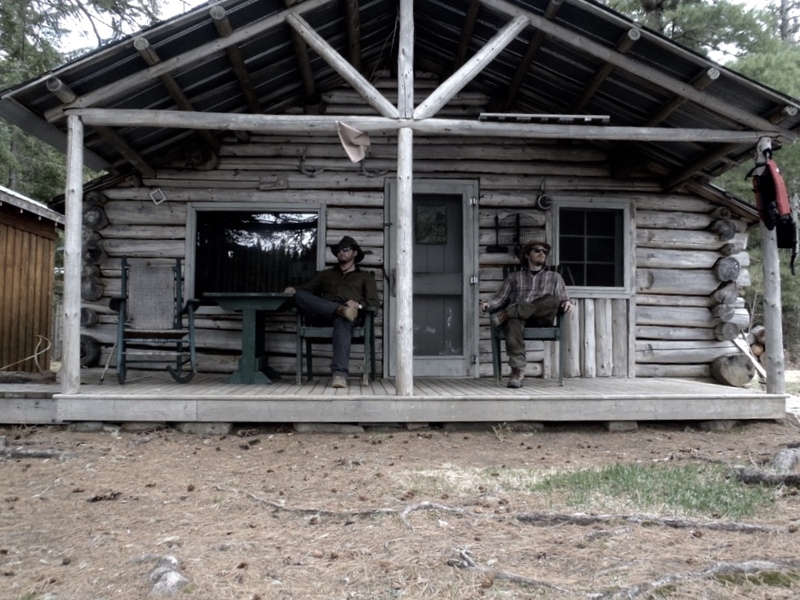 The morning of Sunday, June 1st I woke up on a futon at Shane’s camp on the Renous River to the smells and sounds of fresh brewing coffee. I sat up and worked my arm and shoulder in a throwing motion. “Feels as fresh as that coffee,” I thought. Today was Part II of my ‘elusive double run.’ I was heading down to Boisetown, and up Route 625 to run the Taxis River. Originally my plan was to run it solo and I was a little nervous. I’d run the Taxis before and thought that it was a good, safe candidate for developing my limited solo paddling skills. So I was somewhat relieved and simultaneously disappointed when I called the group and found out that someone had bailed at the last minute, and that I had a bowman. The bowman was a professor friend of mine from the University of New Brunswick. He was born and raised in Poland and had only been in a canoe once before – on a run we refer to as ‘Karnage on the Keswick’. It’ll be fine I thought, I’ll teach him the draw and cross-bow draw strokes and tell him when to use them and we’ll get by – and if that doesn’t work, I’ll tell him to put the paddle down and I’ll paddle solo! Route 625 is a bit of a rough road, it’s a wide gravel road that is easily accessible via car if you take it slow. There are numerous holes and rocks that could easily result in a leaky oil pan — and they will sneak up on you if you aren’t paying attention. I made it to the put-in by around 10:00 a.m. and the guys were there waiting. The water level from the bridge looked like there would be enough to get by, barely. The gauge in Blackville read between 1.3 and 1.4 m — which was fine for the Renous. 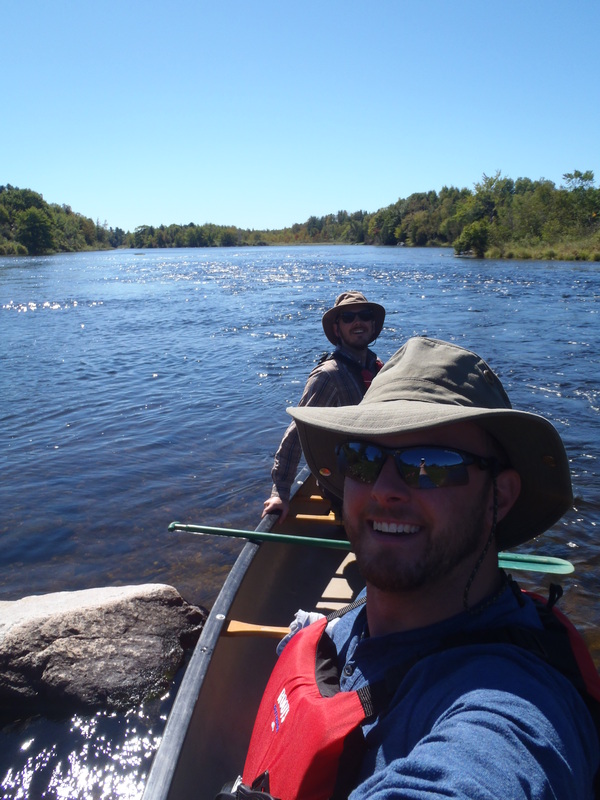 Marek easily had 75 lbs on me, and if I was more-or-less paddling solo, I wanted to be paddling a well trimmed Disco ’69. I grabbed my small 30 L barrel, loaded it up with miscellaneous gear, and jammed it behind the stern — which levelled things out nicely. Only later did I realize that this was the make-shift backrest I’d been waiting my whole life for! Note the guy with his arm raised, clearly loving his new-found backrest. Two other boats were along for the run — two friends, and a father-son team. 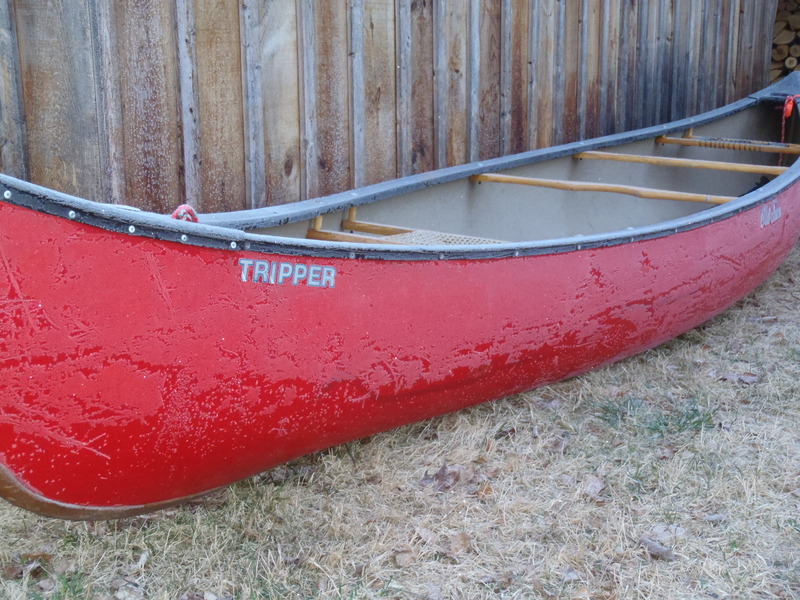 John — the father — was debuting his new (to him) Mad River Escape inflatable folding canoe. 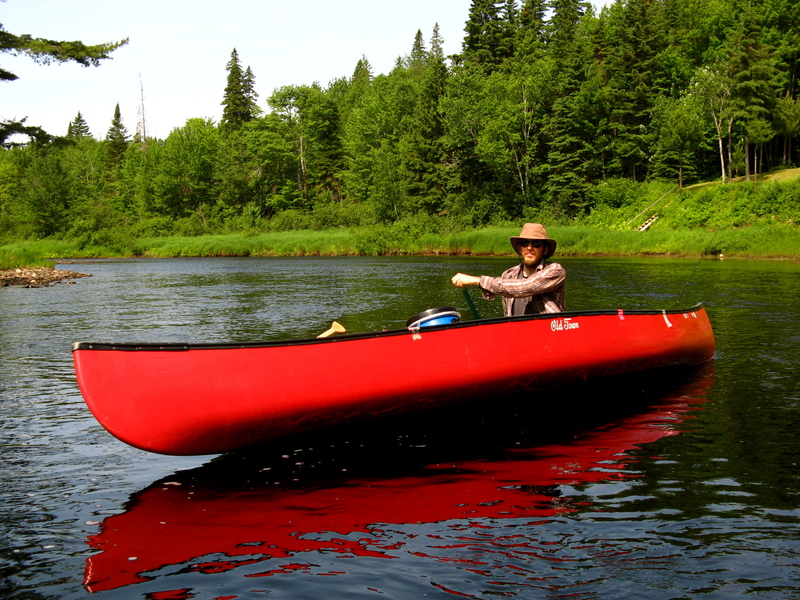 These canoes are very similar to the famous PakBoat folding canoes. I had never seen one in person, so I was interested in seeing how it performed on the water. John didn’t seem worried about rocks or his dog’s claws, so I figured they were pretty tough. If you haven’t seen one before, they have a PVC body with inflatable sides, and an aluminum frame that breaks apart into 32 pieces. The floor is covered in a foam pad. 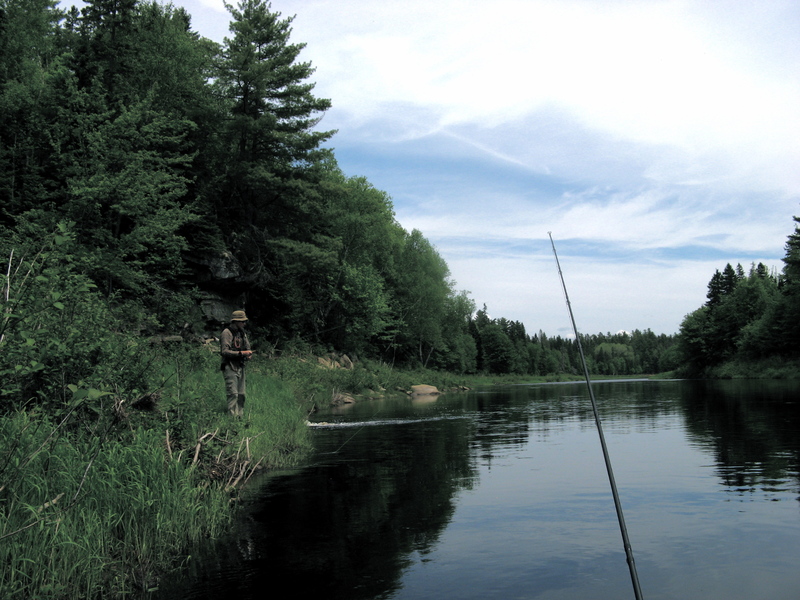 It was another great day on another one of New Brunswick’s world-class rivers. The Taxis River is much smaller and shallower than the Renous. We scraped bottom in quite a few places along the way — if Marek didn’t have a natural eye for finding the deep water we probably would have had to get out and walk a little bit. The scenery surrounding the Taxis can be quite stunning. There is some beautiful old hemlock forest in a few places and some large white pines that are seemingly growing out of bare rock. New Brunswick’s signature red sandstone cliffs were also prevalent along the way. I was particularly impressed by the sandstone that extended underneath the river and formed the river bed. When paddling over sandstone, it appears as though you should be able to reach down and grab a handful, but one of nature’s most powerful forces has taken millennia to carve out its present form. Unfortunately for John, the PakBoat didn’t do so well. 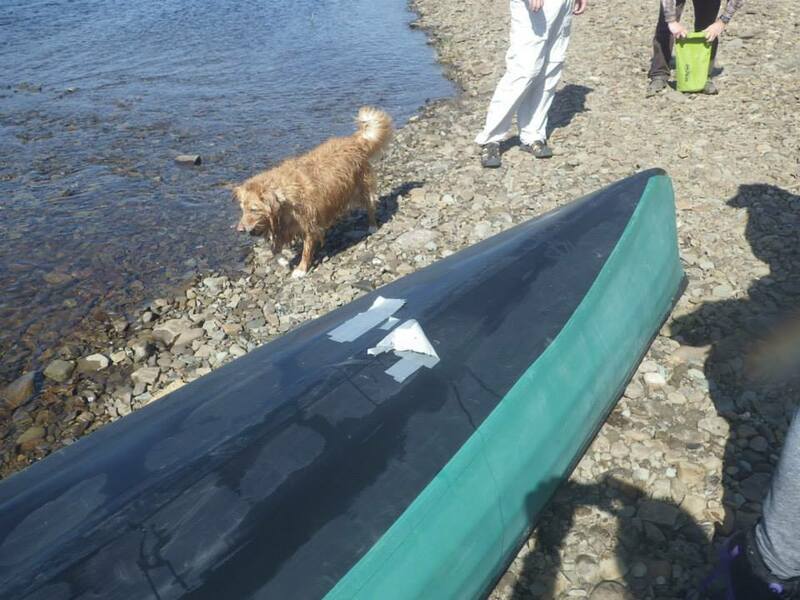 It performed admirably all day, but as we were paddling the bow seat became dislodged and poked two holes in the PVC shell. Marek and I paddled along side John and I asked him “hows the inflatable boat, John?” and his son responded by yelling, “WE’RE TAKING ON WATER!” Thankfully, I remembered one of the items that was in my barrel was a roll of duct tape. 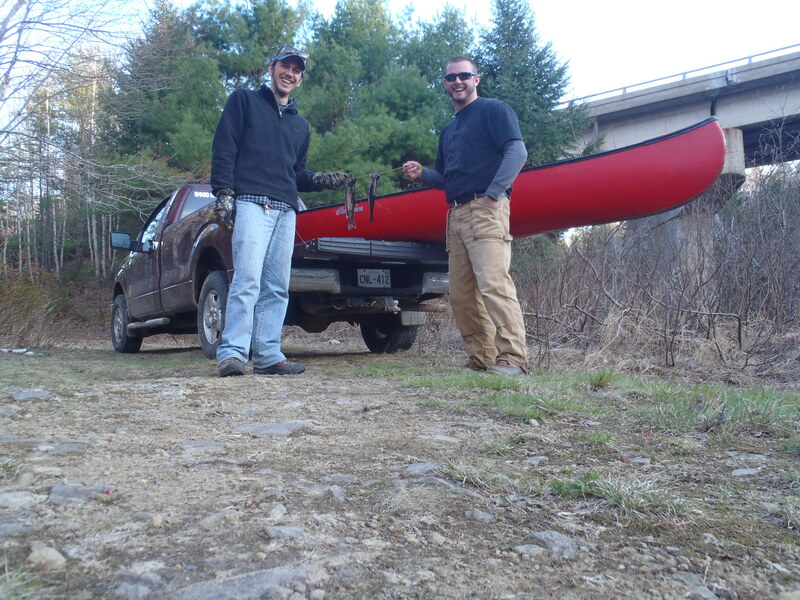 We slid over to the bank and I surprised John with it as they were emptying out their boat. “Oh god, you’re a life saver!” he exclaimed. We applied duct tape patches on the inside and outside of the boat and they held up nicely for the rest of the day. Bottom side of the patch job at the takeout point – not bad!